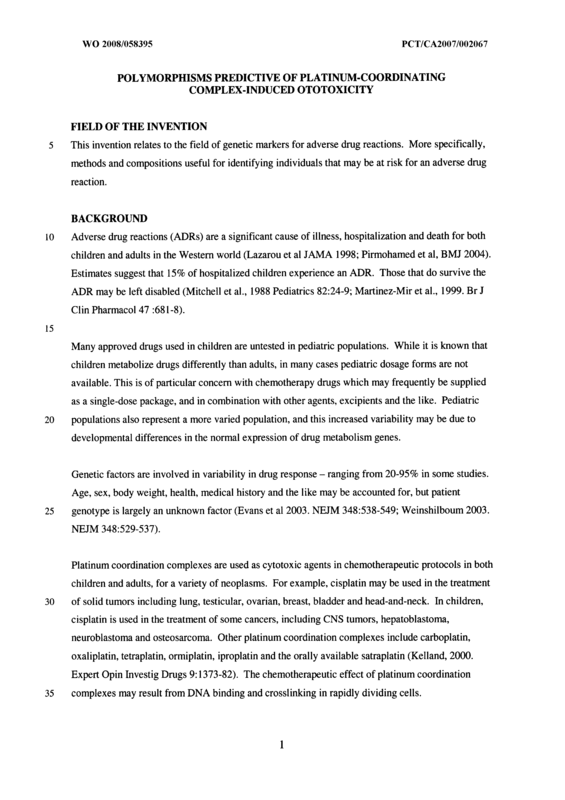 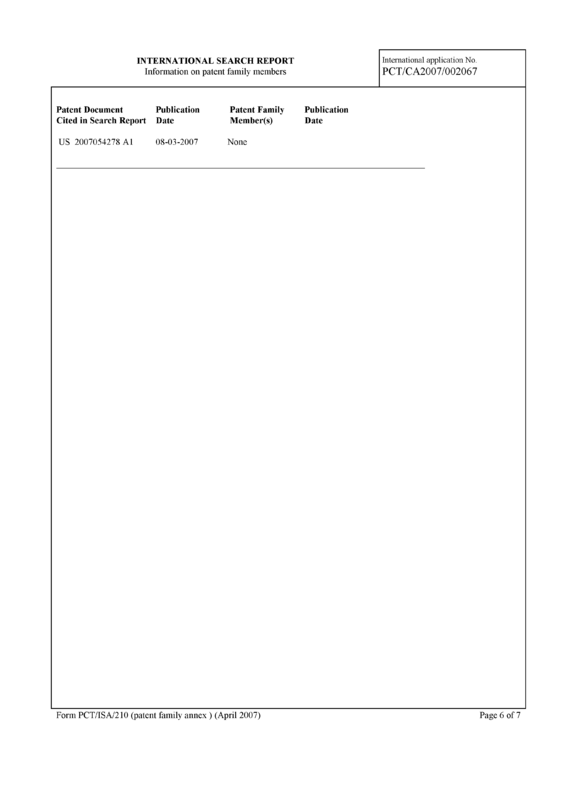 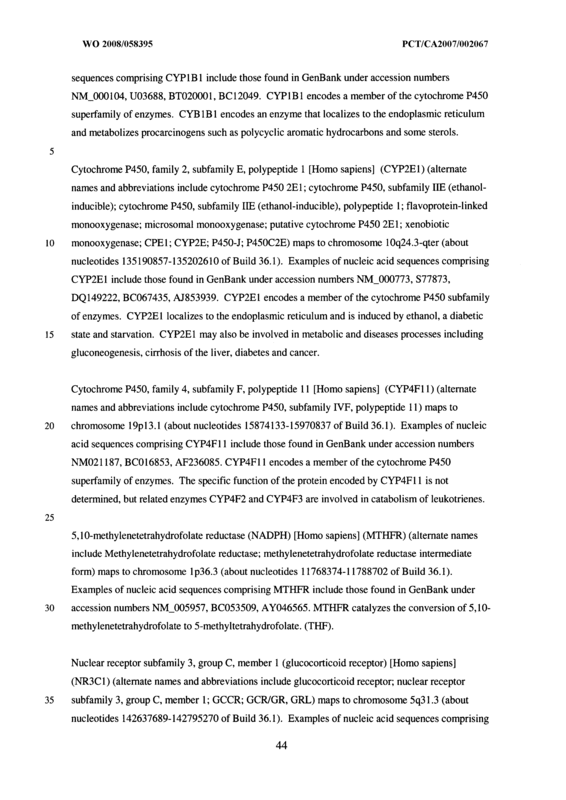 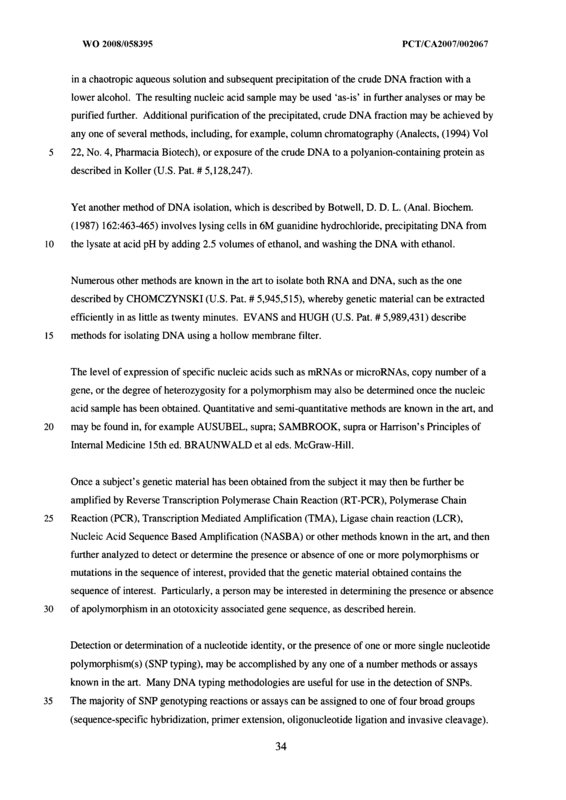 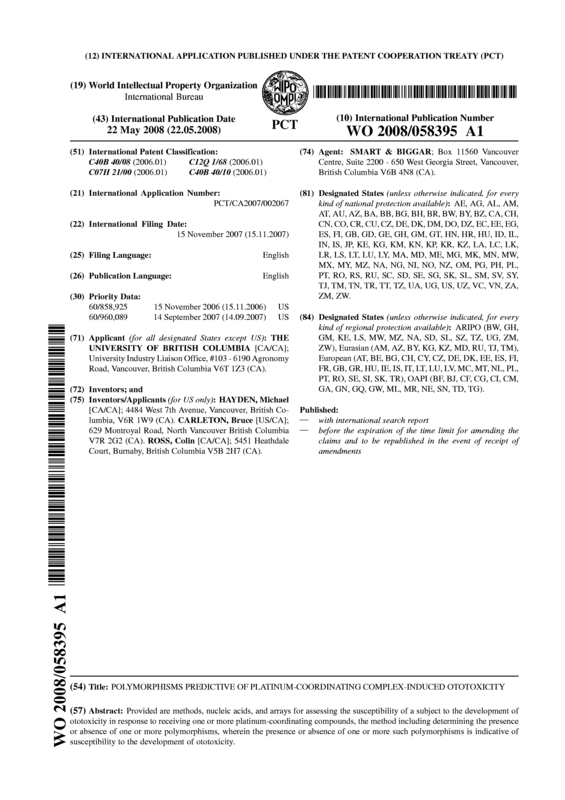 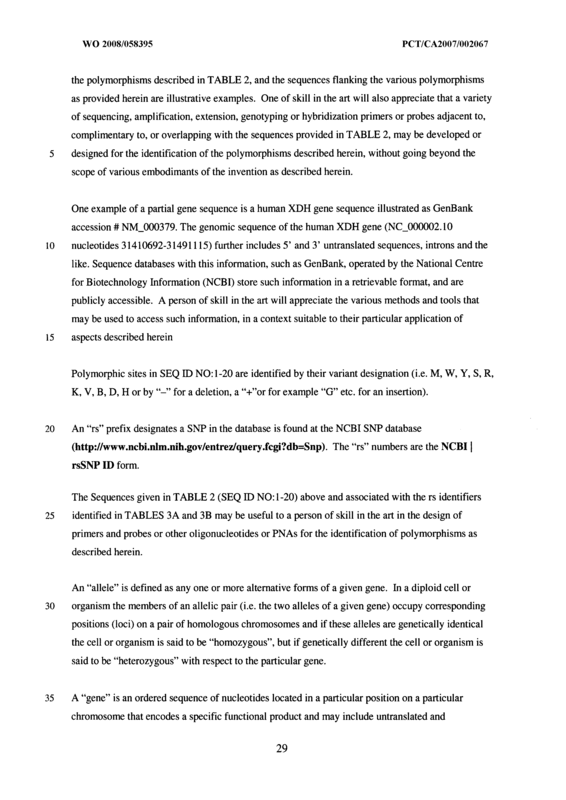 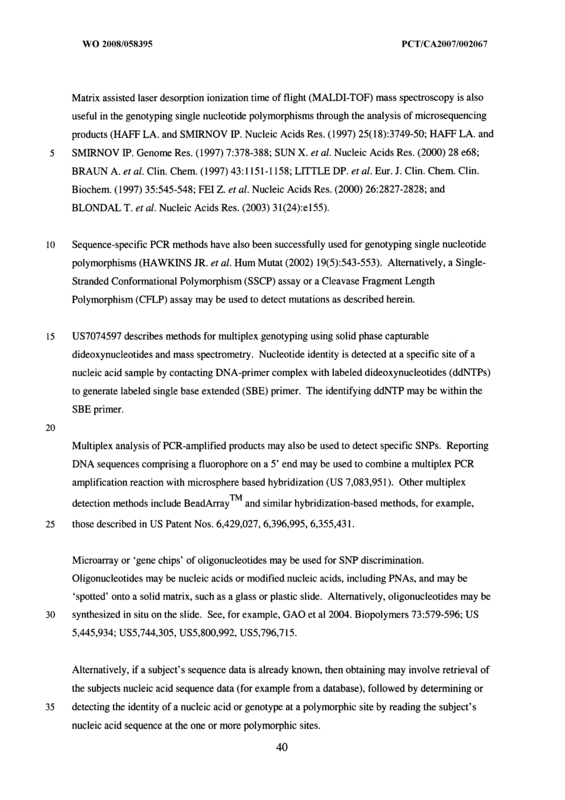 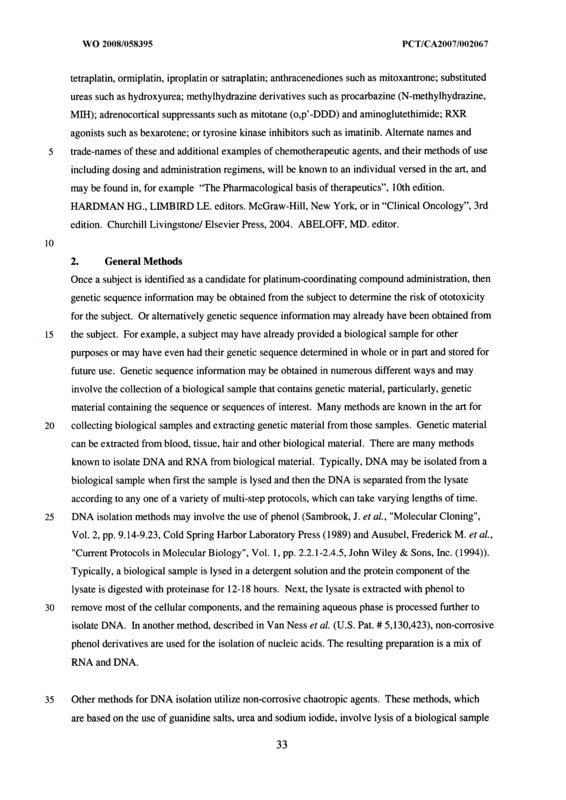 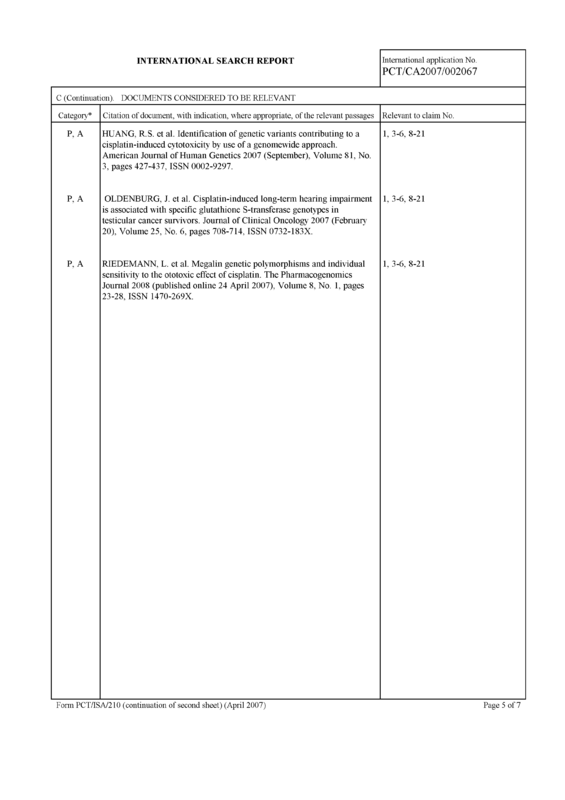 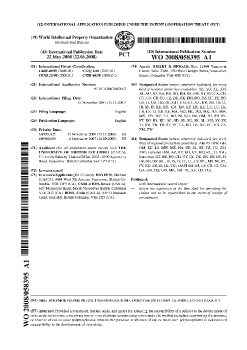 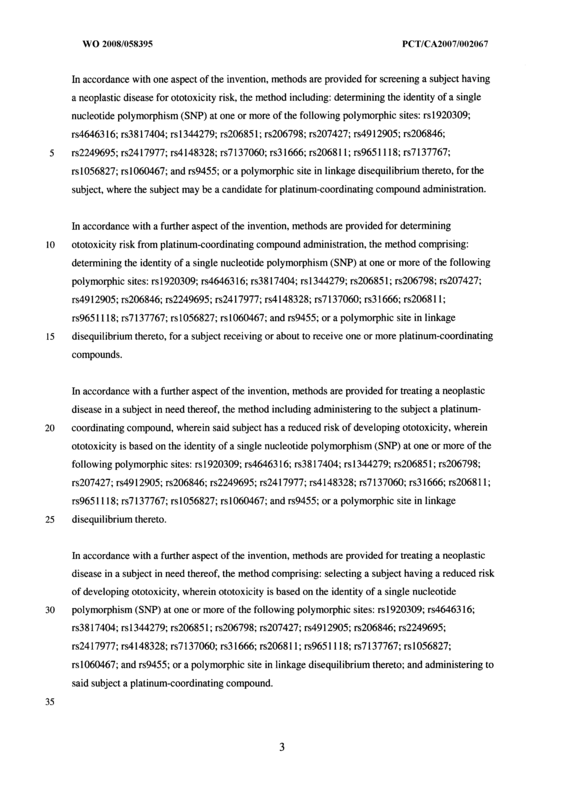 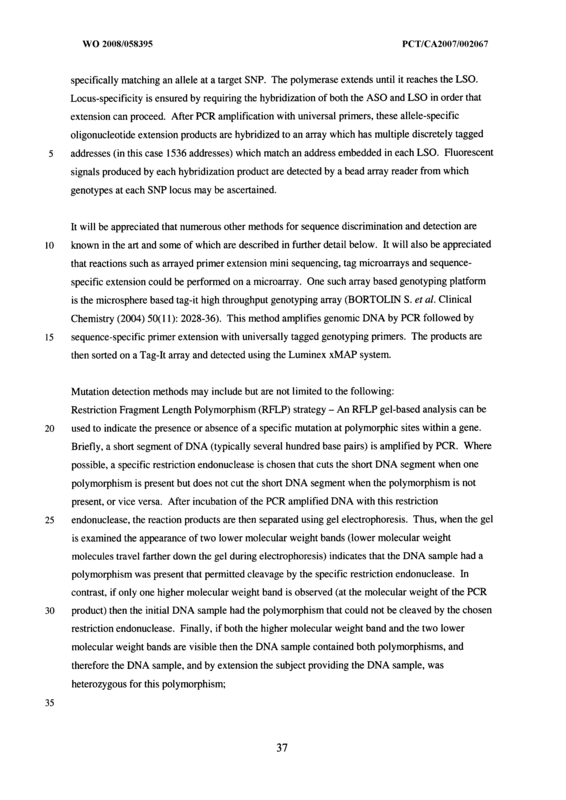 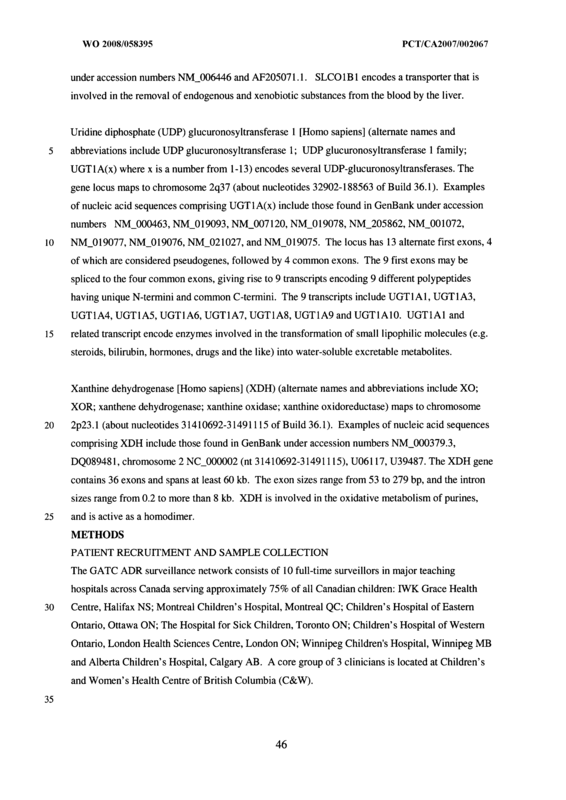 Provided are methods, nucleic acids, and arrays for assessing the susceptibility of a subject to the development of ototoxicity in response to receiving one or more platinum-coordinating compounds, the method including determining the presence or absence of one or more polymorphisms, wherein the presence or absence of one or more such polymorphisms is indicative of susceptibility to the development of ototoxicity. 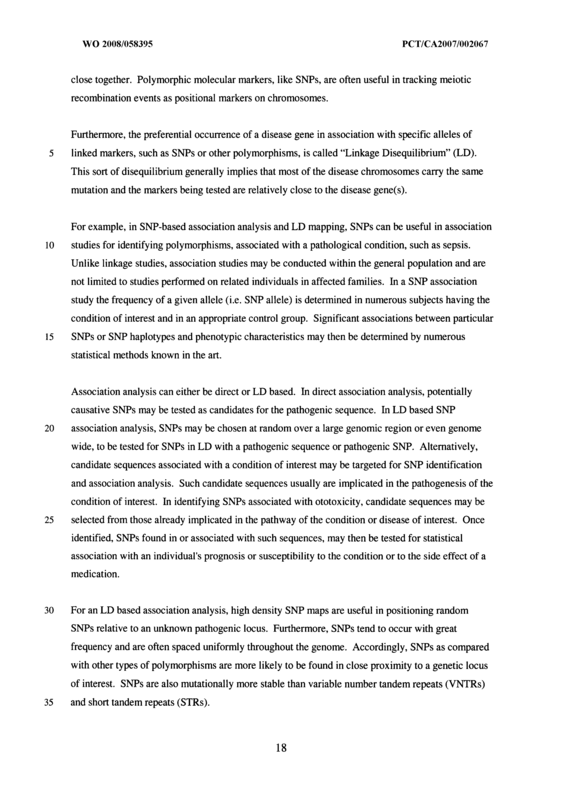 A method of screening a subject having a neoplastic disease for ototoxicity risk, the method comprising: determining the identity of a single nucleotide polymorphism (SNP) at one or more of the following polymorphic sites: rsl920309; rs4646316; rs3817404; rsl344279; rs206851; rs206798; rs207427; rs4912905; rs206846; rs2249695; rs2417977; rs4148328; rs7137060; rs31666; rs206811; rs9651118; rs7137767; rslO56827; rsl060467; and rs9455; or a polymoφhic site in linkage disequilibrium thereto, for the subject, where the subject is a candidate for platinum-coordinating compound administration. 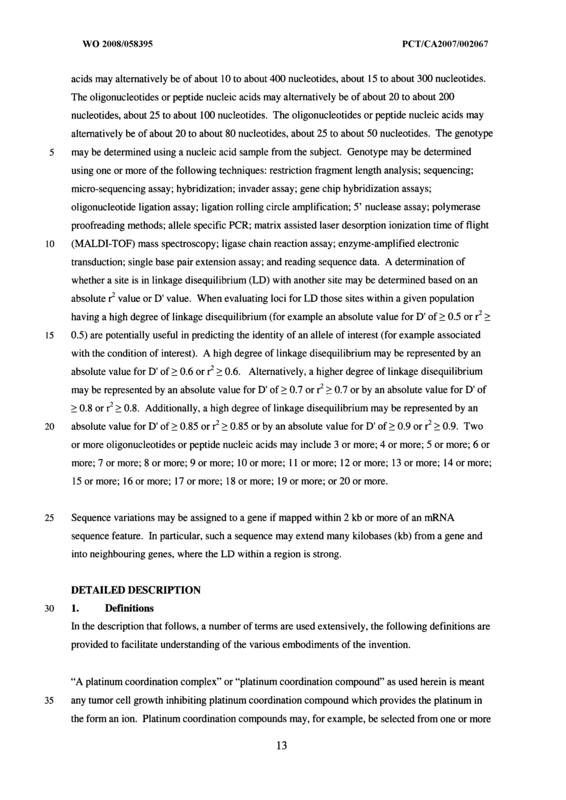 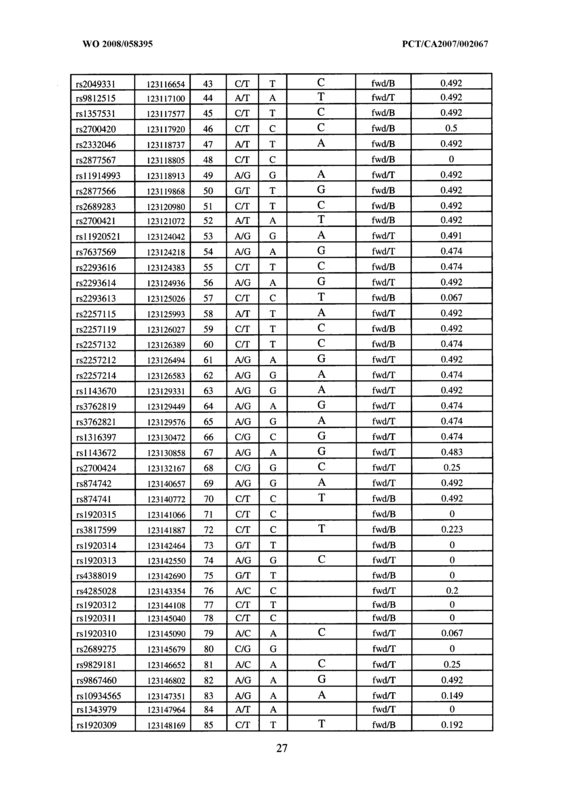 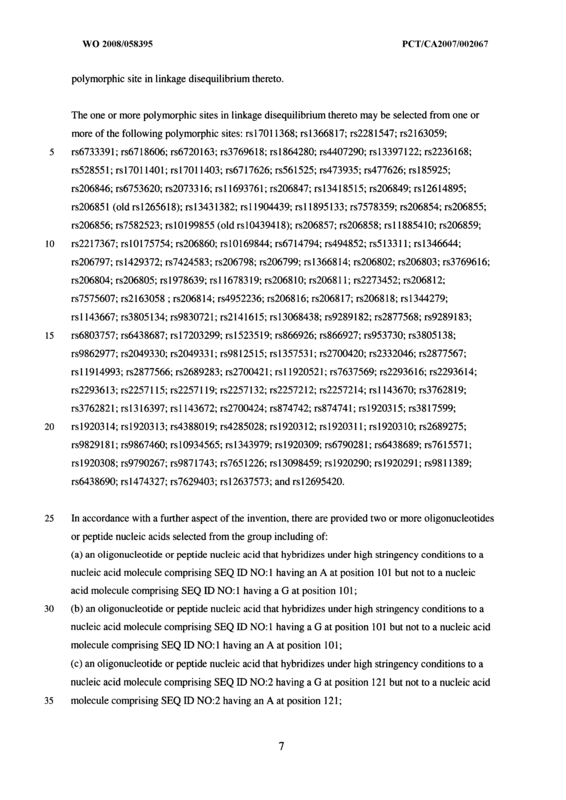 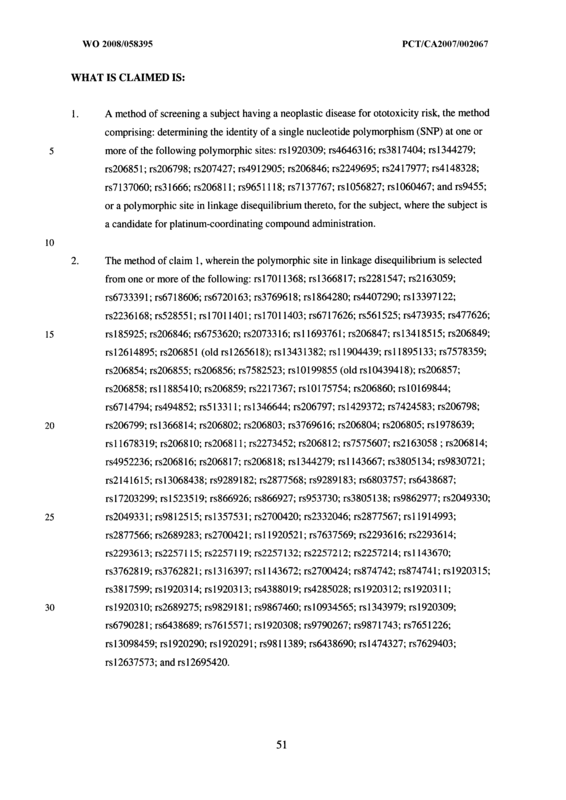 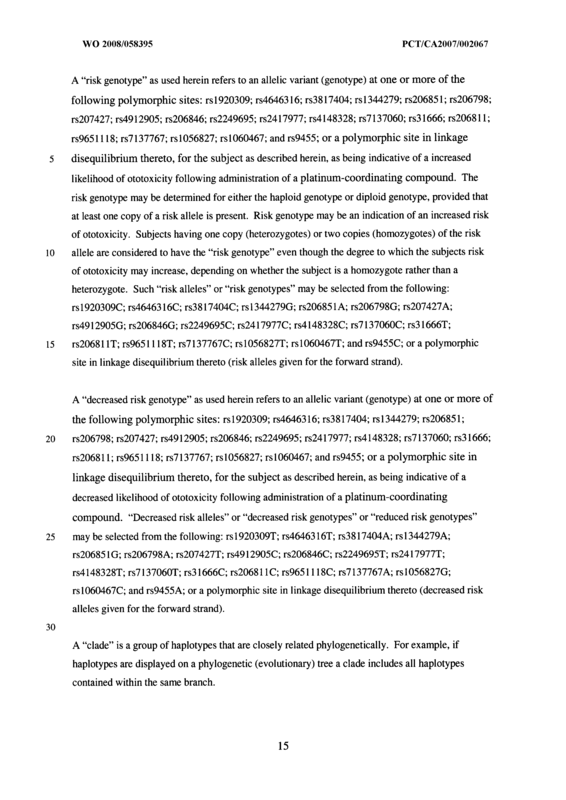 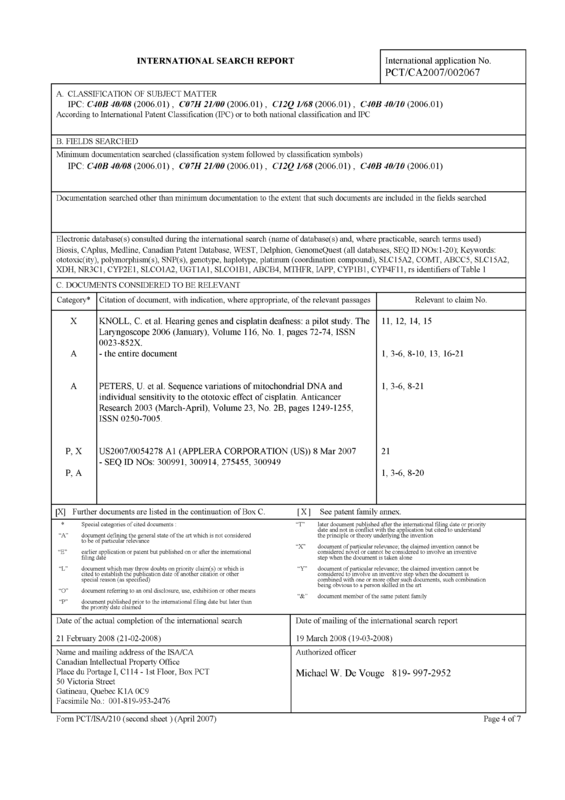 The method of claim 1, wherein the polymorphic site in linkage disequilibrium is selected from one or more of the following: rsl7011368; rsl366817; rs2281547; rs2163059; rs6733391; rs6718606; rs6720163; rs3769618; rsl864280; rs4407290; rsl3397122; rs2236168; «528551; rsl7011401; rsl7011403; rs6717626; rs561525; rs473935; rs477626; rsl85925; rs206846; rs6753620; rs2073316; rsl 1693761; rs206847; rsl3418515; rs206849; rsl2614895; rs206851 (old rsl265618); rsl3431382; rsl 1904439; rsl 1895133; rs7578359; rs206854; rs206855; rs206856; rs7582523; rslO199855 (old rslO439418); rs206857; rs206858; rsl 1885410; rs206859; rs2217367; rslO175754; rs206860; rslO169844; rs6714794; rs494852; rs51331 1; rsl346644; rs206797; rsl429372; rs7424583; rs206798; rs206799; rsl366814; rs206802; rs206803; rs3769616; rs206804; rs206805; rsl978639; rsl 1678319; rs206810; rs206811; rs2273452; rs206812; rs7575607; rs2163058 ; rs206814; rs4952236; rs206816; rs206817; rs206818; rsl344279; rsl 143667; rs3805134; rs9830721; rs2141615; rsl3068438; rs9289182; rs2877568; rs9289183; rs6803757; rs6438687; rsl7203299; rsl523519; rs866926; rs866927; rs953730; rs3805138; rs9862977; rs2049330; rs2049331; rs9812515; rsl357531; rs2700420; rs2332046; rs2877567; rsl 1914993; rs2877566; rs2689283; rs2700421; rsl 1920521; rs7637569; rs2293616; rs2293614; rs2293613; rs22571 15; rs2257119; rs2257132; rs2257212; rs2257214; rsl 143670; rs3762819; rs3762821; rsl316397; rsl 143672; rs2700424; rs874742; rs874741; rsl920315; rs3817599; rsl920314; rsl920313; rs4388019; rs4285028; rsl920312; rsl920311; rsl920310; rs2689275; rs9829181; rs9867460; rsl0934565; rsl343979; rsl920309; rs6790281; rs6438689; rs7615571; rsl920308; rs9790267; rs9871743; rs7651226; rsl3098459; rsl920290; rsl920291; rs9811389; rs6438690; rsl474327; rs7629403; rsl2637573; and rsl2695420. 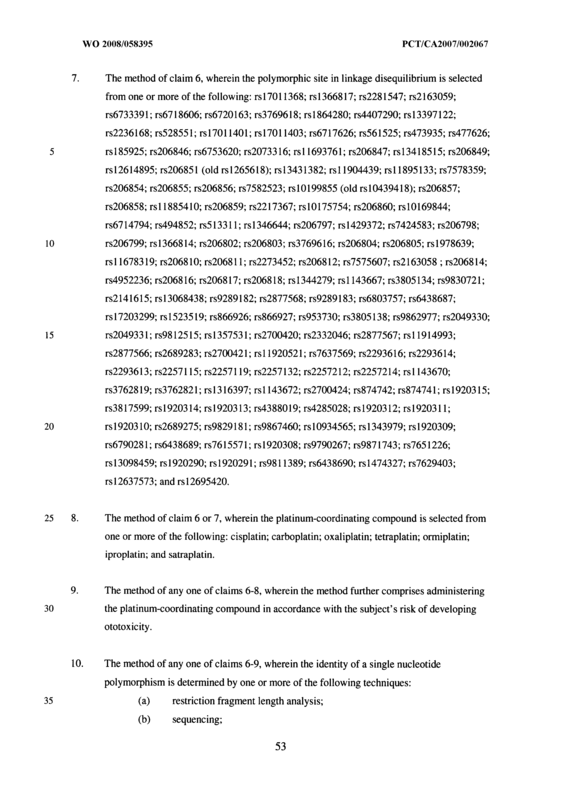 The method of claim 1 or 2, wherein the platinum-coordinating compound is selected from one or more of the following: cisplatin; carboplatin; oxaliplatin; tetraplatin; ormiplatin; iproplatin; and satraplatin. 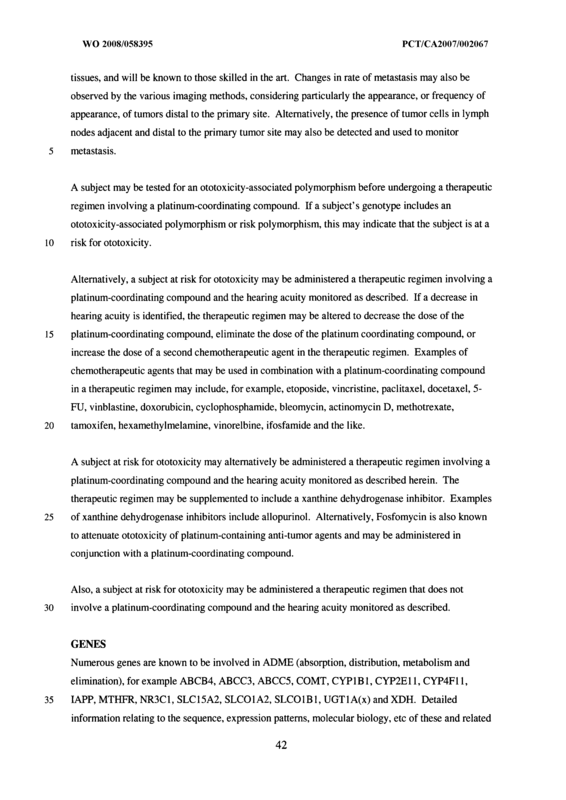 The method of any one of claims 1-3, wherein the method further comprises administering the platinum-coordinating compound in accordance with the subject's risk of developing ototoxicity. 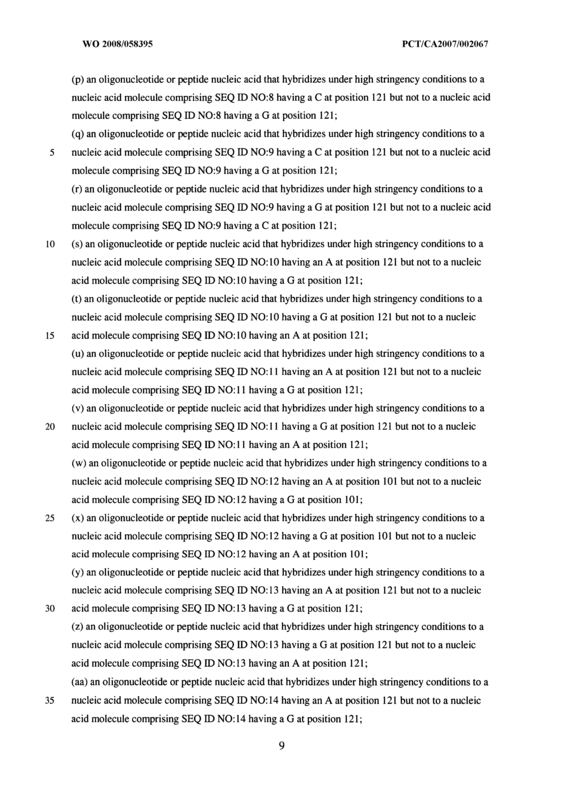 A method of determining ototoxicity risk from platinum-coordinating compound administration, the method comprising: determining the identity of a single nucleotide polymorphism (SNP) at one or more of the following polymorphic sites: rs 1920309; rs4646316; rs3817404; rsl344279; rs206851; rs206798; rs207427; rs4912905; rs206846; rs2249695; rs2417977; rs4148328; rs7137060; rs31666; rs206811; rs9651118; rs7137767; rslO56827; rsl060467; and rs9455; or a polymorphic site in linkage disequilibrium thereto, for a subject receiving or about to receive one or more platinum-coordinating compounds. 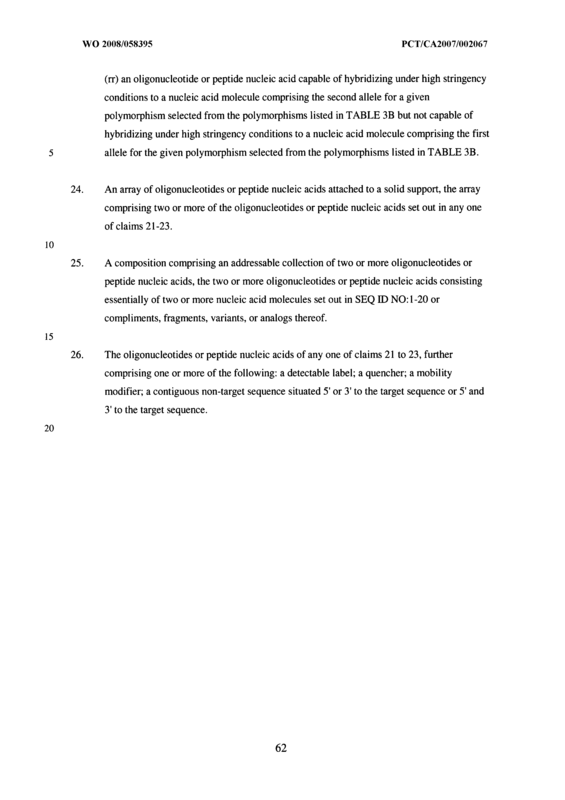 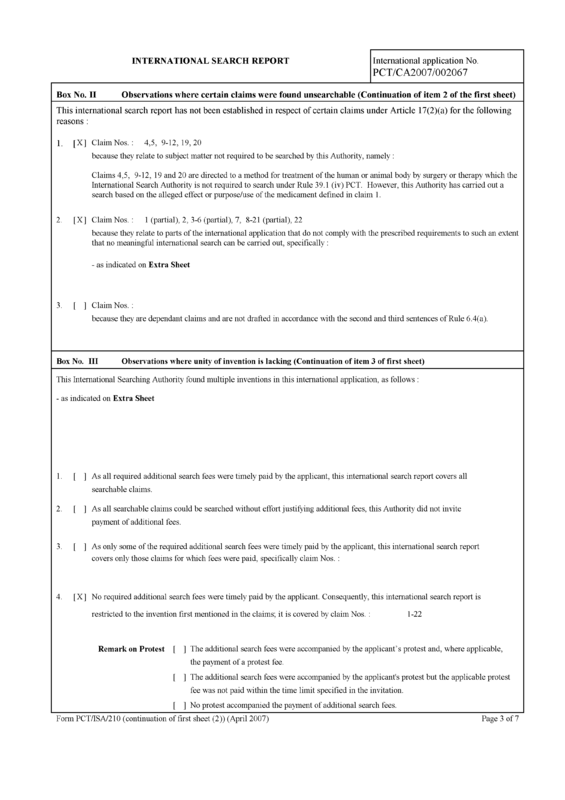 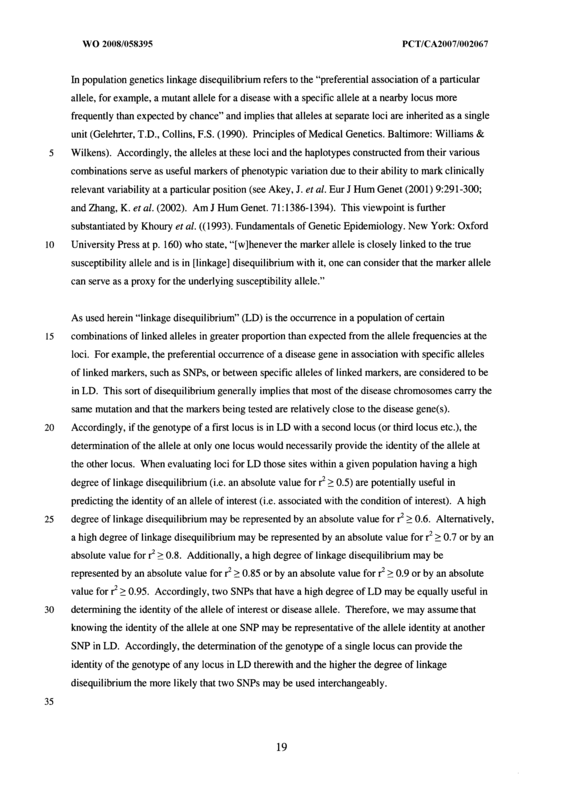 The method of claim 6, wherein the polymorphic site in linkage disequilibrium is selected from one or more of the following: rsl7011368; rsl366817; rs2281547; rs2163059; rs6733391 ; rs6718606; rs6720163; rs3769618; rsl864280; rs4407290; rsl3397122; rs2236168; rs528551; rsl7011401; rsl701 1403; rs6717626; rs561525; rs473935; rs477626; rsl85925; rs206846; rs6753620; rs2073316; rsl 1693761; rs206847; rsl3418515; rs206849; rsl2614895; rs206851 (old rsl 265618); rsl3431382; rsl l904439; rsl l895133; rs7578359; rs206854; rs206855; rs206856; rs7582523; rslO199855 (old rslO439418); rs206857; rs206858; rsl 1885410; rs206859; rs2217367; rslO175754; rs206860; rslO169844; rs6714794; rs494852; rs513311; rsl346644; rs206797; rsl429372; rs7424583; rs206798; rs206799; rsl366814; rs206802; rs206803; rs3769616; rs206804; rs206805; rsl978639; rsl 1678319; rs206810; rs206811 ; rs2273452; rs206812; rs7575607; rs2163058 ; rs206814; rs4952236; rs206816; rs206817; rs206818; rsl344279; rsl 143667; rs3805134; rs9830721 ; rs2141615; rsl3068438; rs9289182; rs2877568; rs9289183; rs6803757; rs6438687; rsl7203299; rsl523519; rs866926; rs866927; rs953730; rs3805138; rs9862977; rs2049330; «2049331; rs9812515; rsl357531 ; rs2700420; rs2332046; rs2877567; rsl 1914993; rs2877566; rs2689283; rs2700421 ; rsl 1920521 ; rs7637569; rs2293616; rs2293614; rs2293613; rs22571 15; rs2257119; rs2257132; rs2257212; rs2257214; rsl 143670; rs3762819; rs3762821 ; rsl316397; rsl l43672; rs2700424; rs874742; rs874741; rsl920315; rs3817599; rsl920314; rsl920313; rs4388019; rs4285028; rsl920312; rsl92031 1; rsl920310; rs2689275; rs9829181; rs9867460; rslO934565; rsl343979; rsl920309; rs6790281; rs6438689; rs7615571; rsl920308; rs9790267; rs9871743; rs7651226; rsl3098459; rsl920290; rsl920291 ; rs9811389; rs6438690; rsl474327; rs7629403; rsl2637573; and rsl2695420. 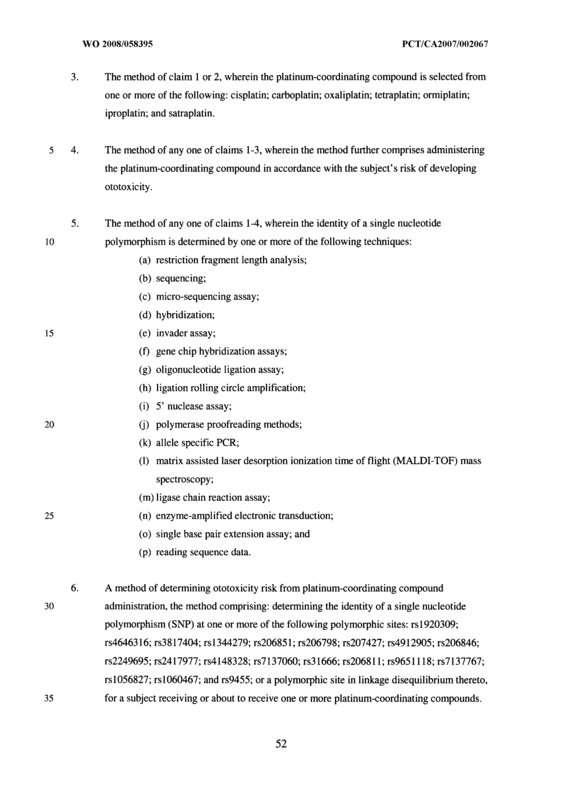 The method of claim 6 or 7, wherein the platinum-coordinating compound is selected from one or more of the following: cisplatin; carboplatin; oxaliplatin; tetraplatin; ormiplatin; iproplatin; and satraplatin. 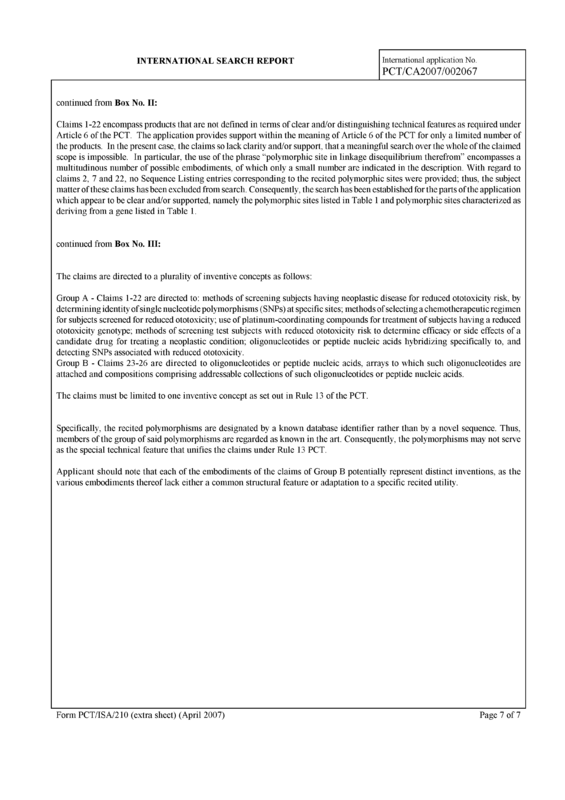 The method of any one of claims 6-8, wherein the method further comprises administering the platinum-coordinating compound in accordance with the subject's risk of developing ototoxicity. 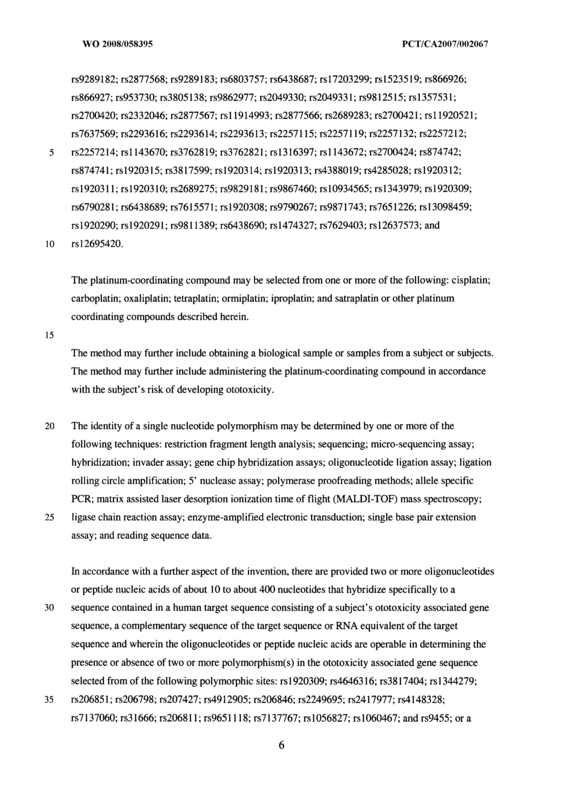 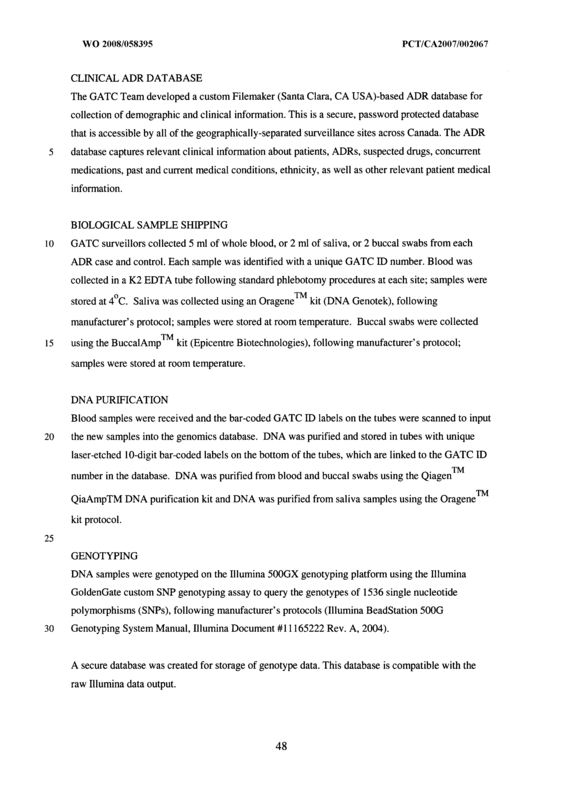 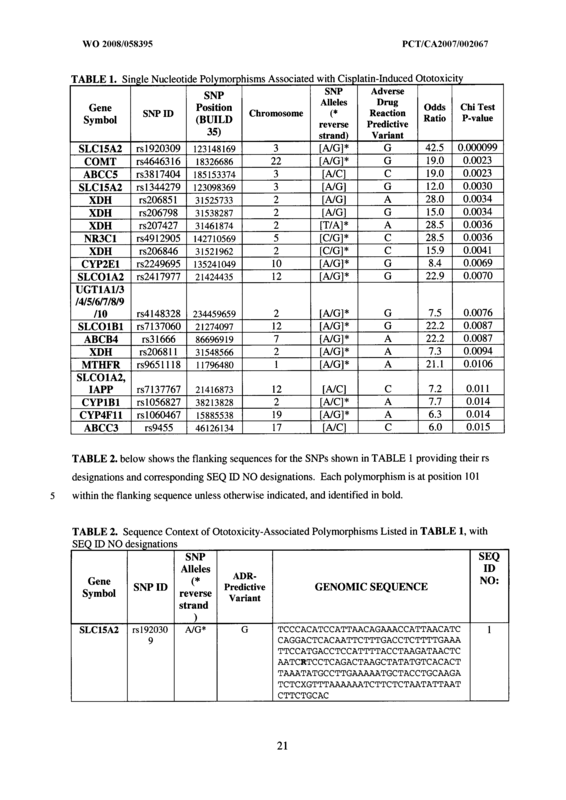 (o) single base pair extension assay; and (p) reading sequence data. 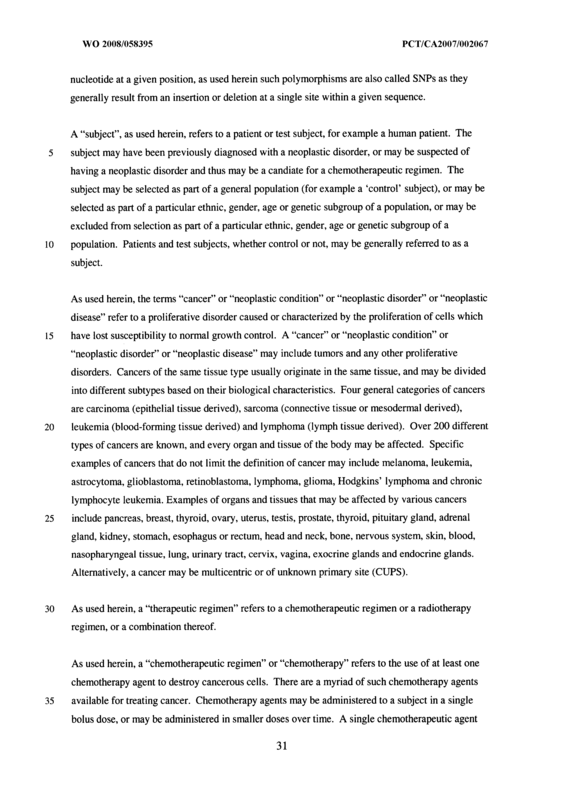 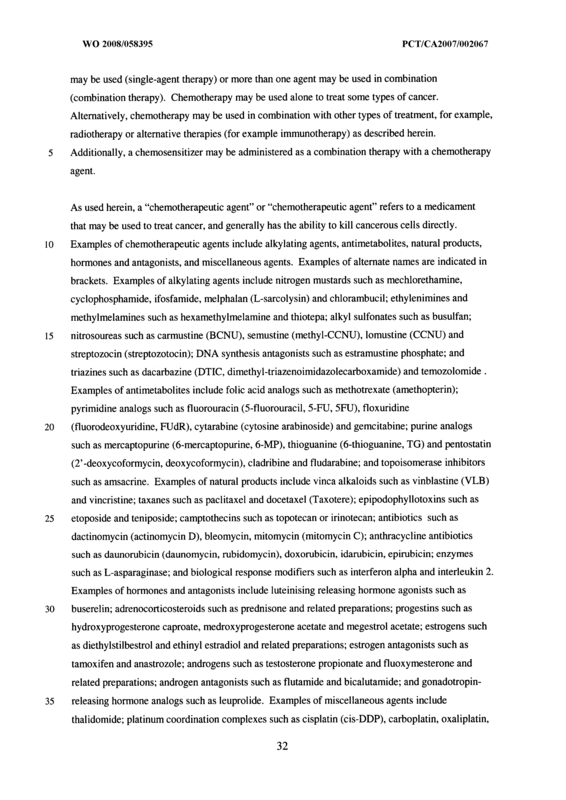 A method of treating a neoplastic disease in a subject in need thereof, the method comprising administering to the subject one or more platinum-coordinating compound, wherein said subject has a reduced risk of developing ototoxicity, wherein ototoxicity is based on the identity of a single nucleotide polymorphism (SNP) at one or more of the following polymorphic sites: rsl920309; rs4646316; rs3817404; rsl344279; rs206851; rs206798; rs207427; rs4912905; rs206846; rs2249695; rs2417977; rs4148328; rs7137060; rs31666; rs20681 1 ; rs9651 1 18; rs7137767; rslO56827; rsl060467; and rs9455; or a polymorphic site in linkage disequilibrium thereto. 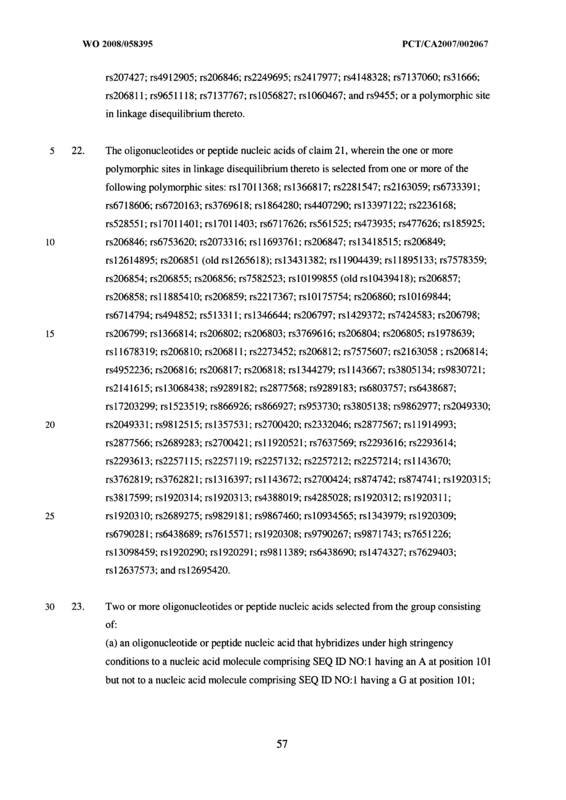 (a) selecting a subject having a reduced risk of developing ototoxicity, wherein ototoxicity is based on the identity of a single nucleotide polymorphism (SNP) at one or more of the following polymorphic sites: rs 1920309; rs4646316; rs3817404; rsl344279; rs206851 ; rs206798; rs207427; rs4912905; rs206846; rs2249695; rs2417977; rs4148328; rs7137060; rs31666; rs206811 ; rs9651118; rs7137767; rslO56827; rsl060467; and rs9455; or a polymorphic site in linkage disequilibrium thereto; and (b) administering to said subject one or more platinum-coordinating compound. 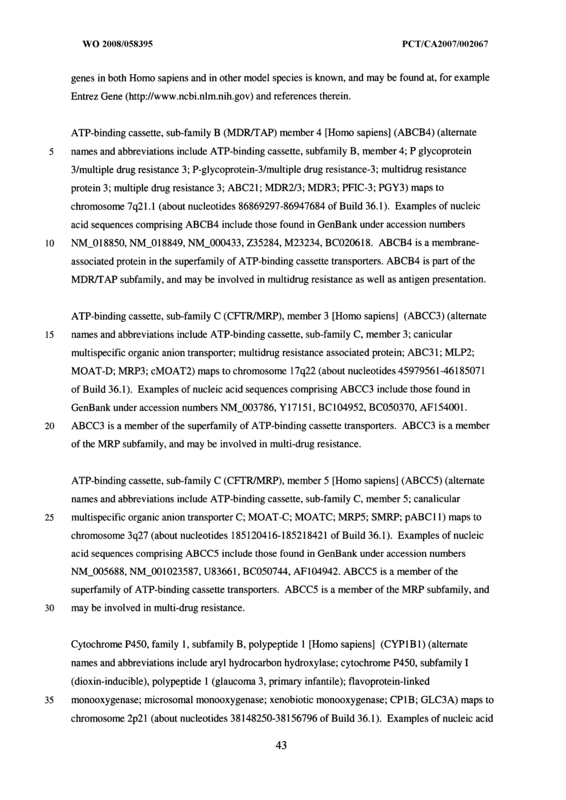 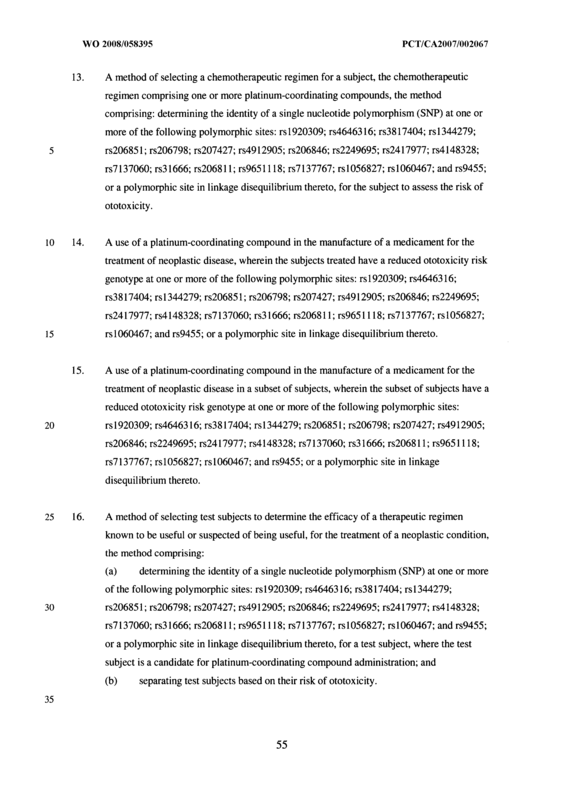 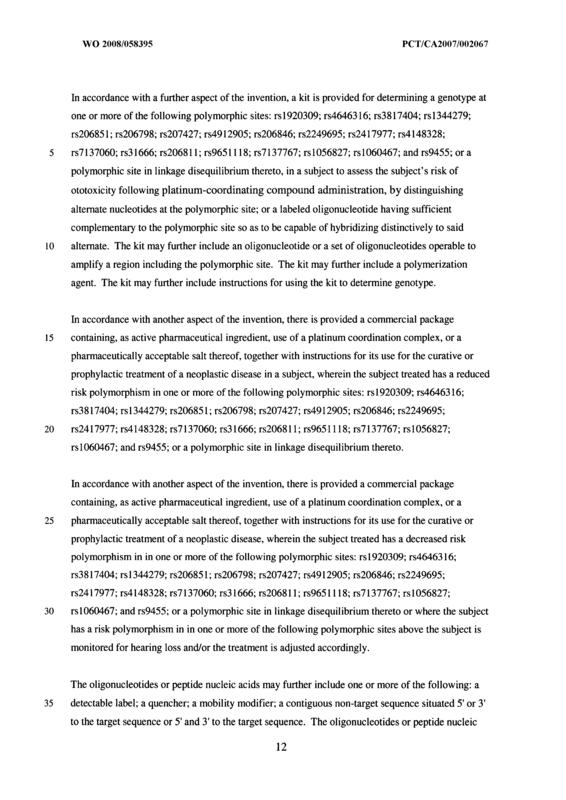 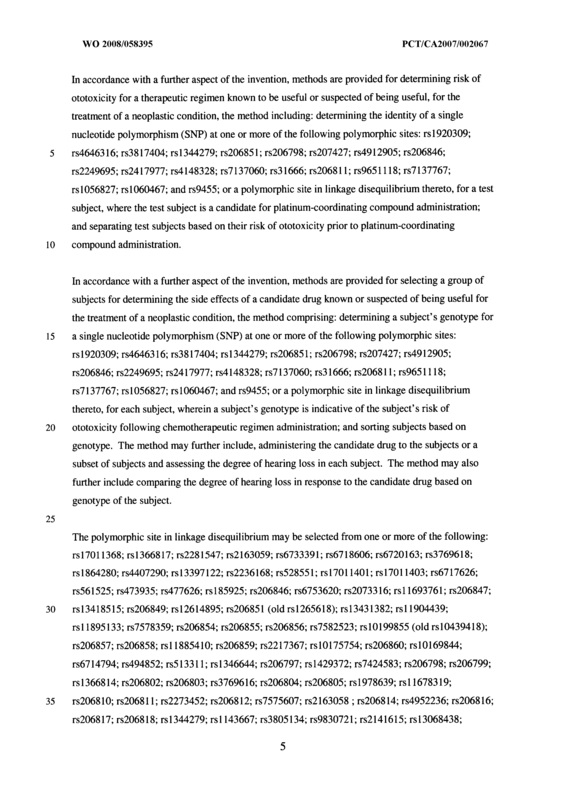 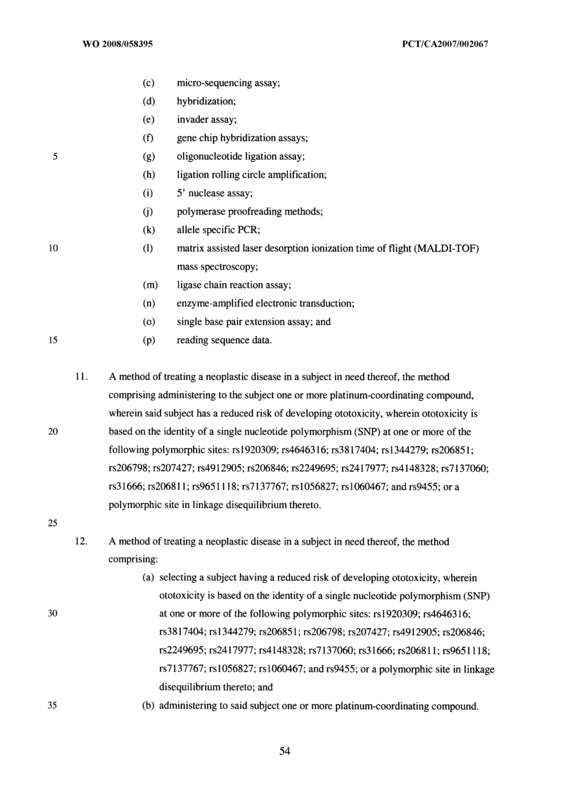 A method of selecting a chemotherapeutic regimen for a subject, the chemotherapeutic regimen comprising one or more platinum-coordinating compounds, the method comprising: determining the identity of a single nucleotide polymorphism (SNP) at one or more of the following polymorphic sites: rsl920309; rs4646316; rs3817404; rsl344279; rs206851; rs206798; rs207427; rs4912905; rs206846; rs2249695; rs2417977; rs4148328; rs7137060; rs31666; rs206811; rs96511 18; rs7137767; rslO56827; rsl060467; and rs9455; or a polymorphic site in linkage disequilibrium thereto, for the subject to assess the risk of ototoxicity. 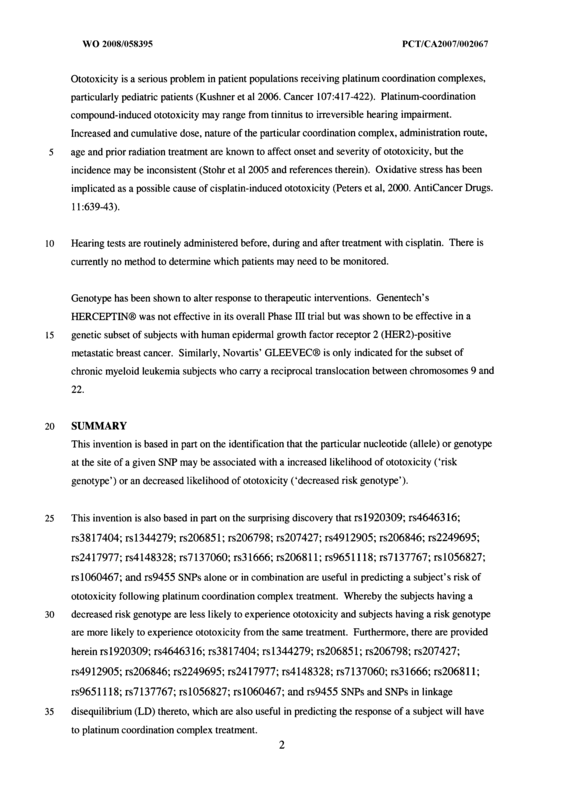 A use of a platinum-coordinating compound in the manufacture of a medicament for the treatment of neoplastic disease, wherein the subjects treated have a reduced ototoxicity risk genotype at one or more of the following polymorphic sites: rs 1920309; rs4646316; rs3817404; rsl344279; rs206851; rs206798; rs207427; rs4912905; rs206846; rs2249695; rs2417977; rs4148328; rs7137060; rs31666; rs206811; rs9651118; rs7137767; rslO56827; rsl060467; and rs9455; or a polymorphic site in linkage disequilibrium thereto. 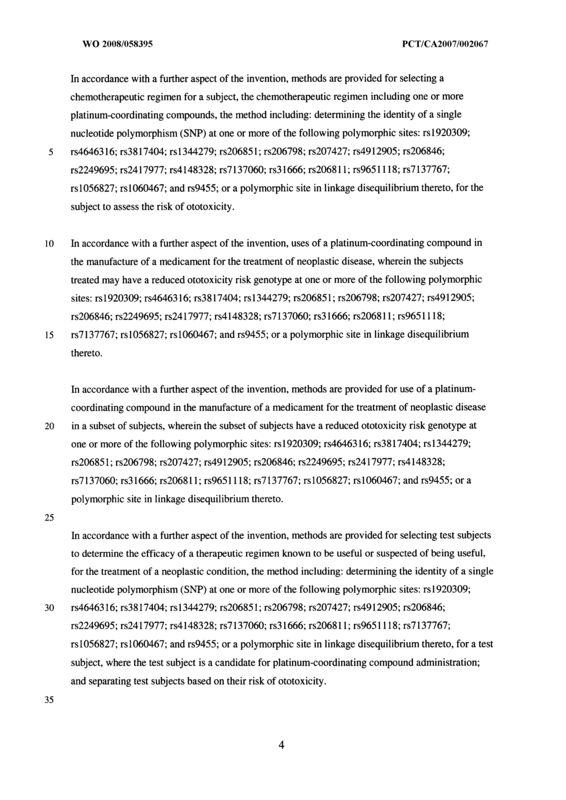 A use of a platinum-coordinating compound in the manufacture of a medicament for the treatment of neoplastic disease in a subset of subjects, wherein the subset of subjects have a reduced ototoxicity risk genotype at one or more of the following polymorphic sites: rsl920309; rs4646316; rs3817404; rsl344279; rs206851; rs206798; rs207427; rs4912905; rs206846; rs2249695; rs2417977; rs4148328; rs7137060; rs31666; rs206811; rs9651118; rs7137767; rslO56827; rsl060467; and rs9455; or a polymorphic site in linkage disequilibrium thereto. 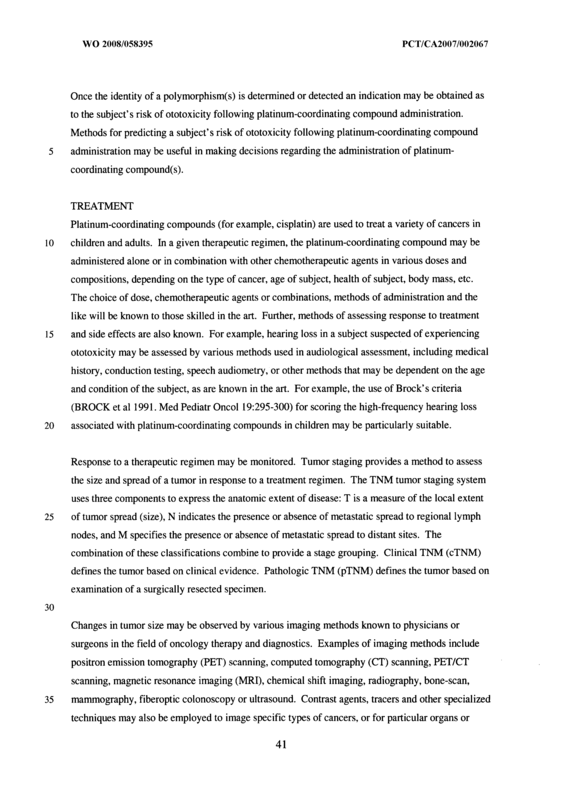 (b) separating test subjects based on their risk of ototoxicity. 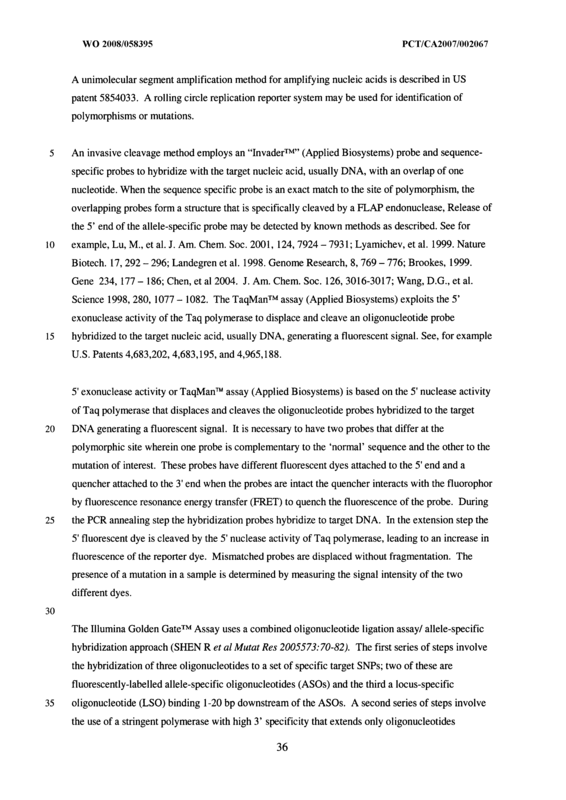 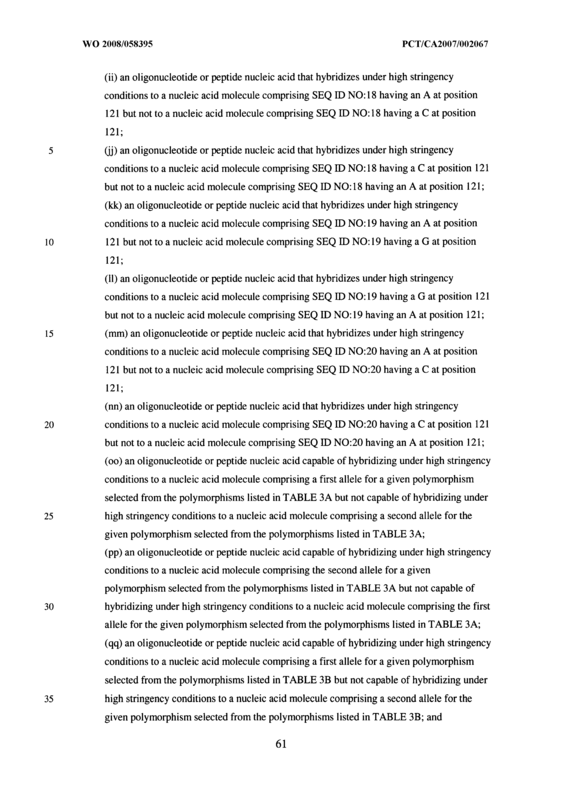 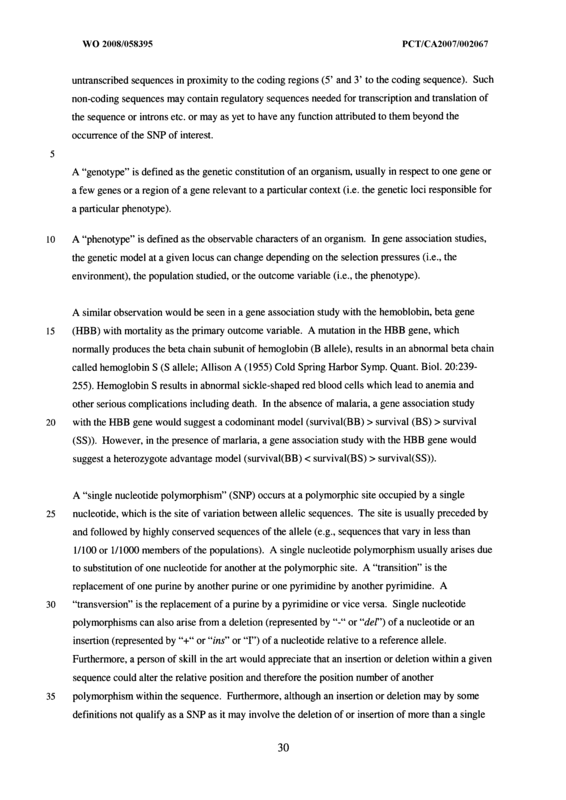 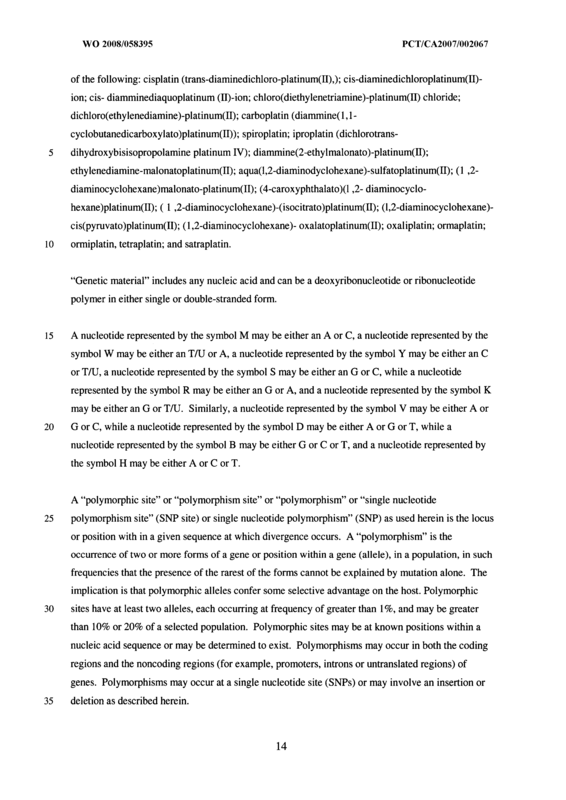 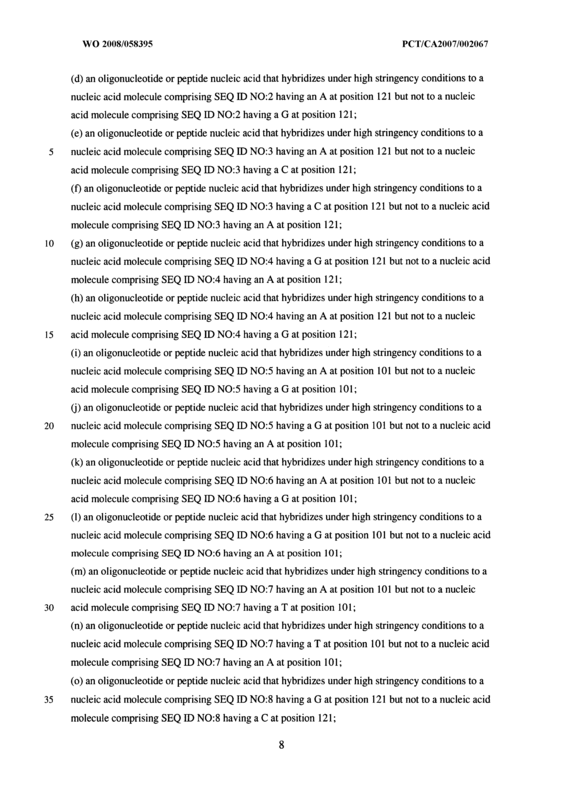 (a) determining the identity of a single nucleotide polymorphism (SNP) at one or more of the following polymorphic sites: rsl920309; rs4646316; rs3817404; rsl344279; rs206851; rs206798; rs207427; rs4912905; rs206846; rs2249695; rs2417977; rs4148328; rs7137060; rs31666; rs206811 ; rs9651 118; rs7137767; rslO56827; rsl060467; and rs9455; or a polymorphic site in linkage disequilibrium thereto, for a test subject, where the test subject is a candidate for platinum-coordinating compound administration; and (b) separating test subjects based on their risk of ototoxicity prior to platinum- coordinating compound administration. 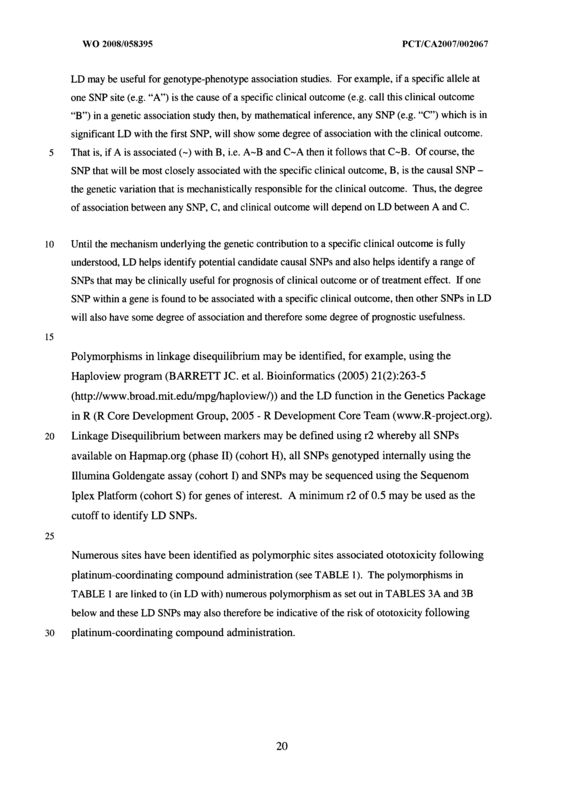 (SNP) at one or more of the following polymorphic sites: rsl920309; rs4646316; rs3817404; rsl344279; rs206851; rs206798; rs207427; rs4912905; rs206846; rs2249695; rs2417977; rs4148328; rs7137060; rs31666; rs206811 ; rs9651118; rs7137767; rslO56827; rslO6O467; and rs9455; or a polymorphic site in linkage disequilibrium thereto, for each subject, wherein a subject's genotype is indicative of the subject's risk of ototoxicity following chemotherapeutic regimen administration; and sorting subjects based on genotype. 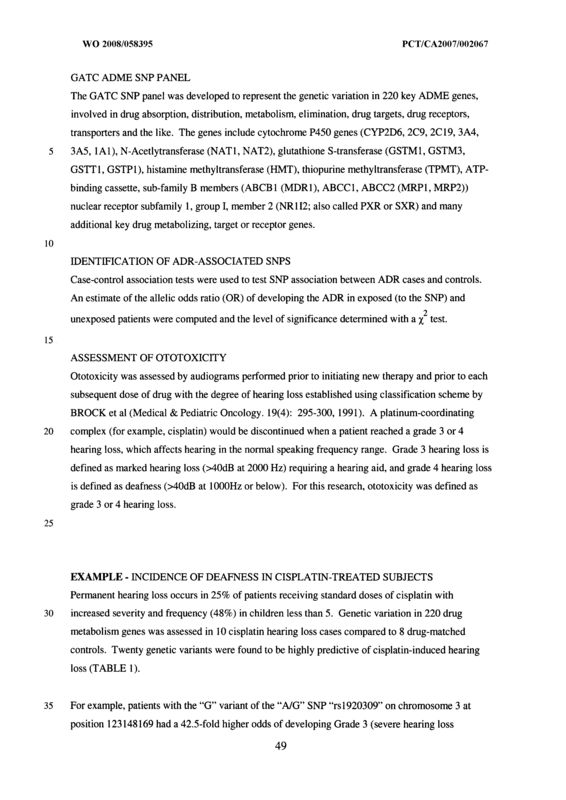 The method of claim 18 further comprising, administering the candidate drug to the subjects or a subset of subjects and assessing the degree of hearing loss in each subject. 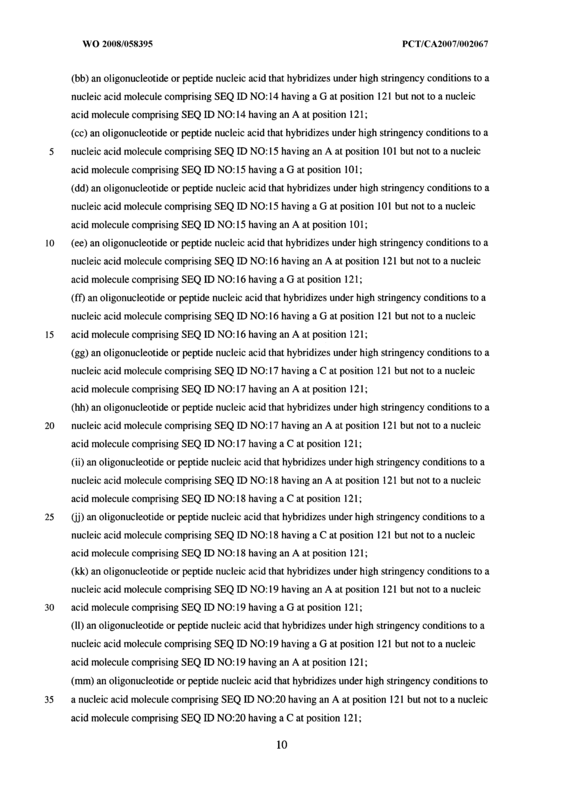 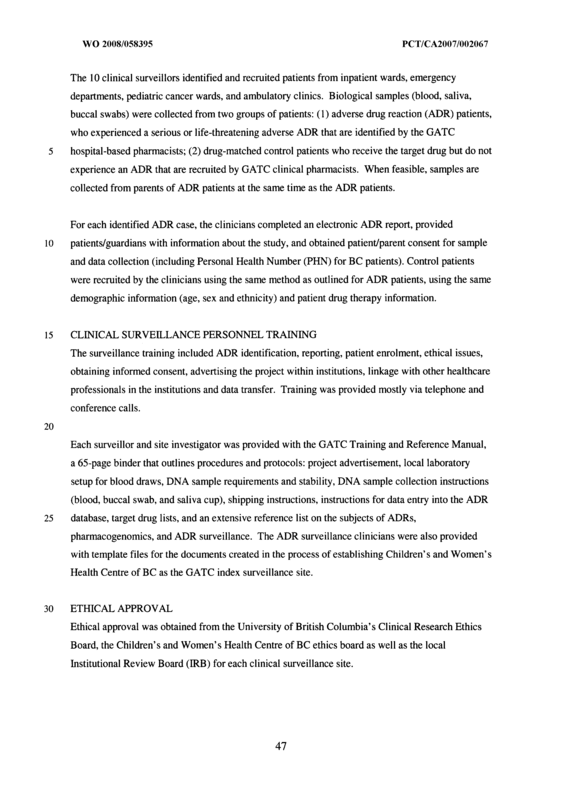 The method of claim 19, further comprising comparing the degree of hearing loss in response to the candidate drug based on genotype of the subject. 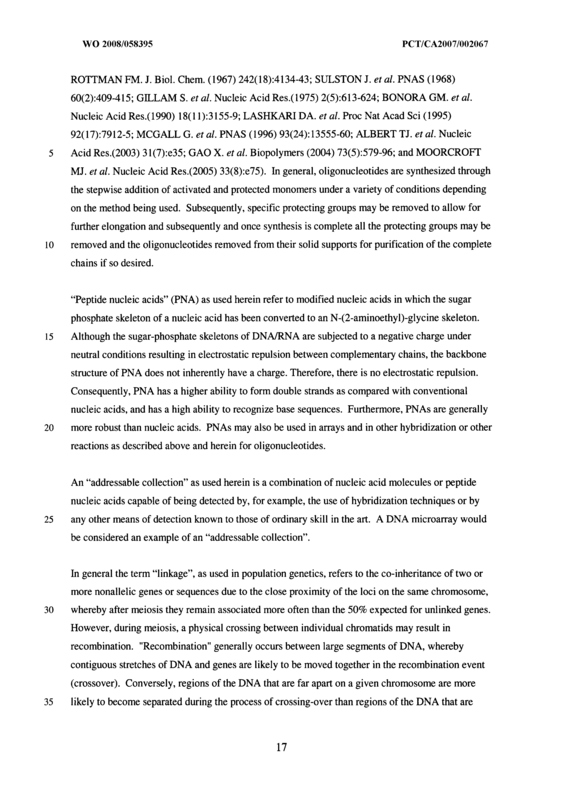 Two or more oligonucleotides or peptide nucleic acids of about 10 to about 400 nucleotides that hybridize specifically to a sequence contained in a human target sequence consisting of a subject's ototoxicity associated gene sequence, a complementary sequence of the target sequence or RNA equivalent of the target sequence and wherein the oligonucleotides or peptide nucleic acids are operable in determining the presence or absence of two or more polymorphism(s) in the ototoxicity associated gene sequence selected from of the following polymorphic sites: rsl920309; rs4646316; rs3817404; rsl344279; rs206851; rs206798; rs207427; rs4912905; rs206846; rs2249695; rs2417977; rs4148328; rs7137060; rs31666; rs206811 ; rs96511 18; rs7137767; rslO56827; rsl060467; and rs9455; or a polymorphic site in linkage disequilibrium thereto. 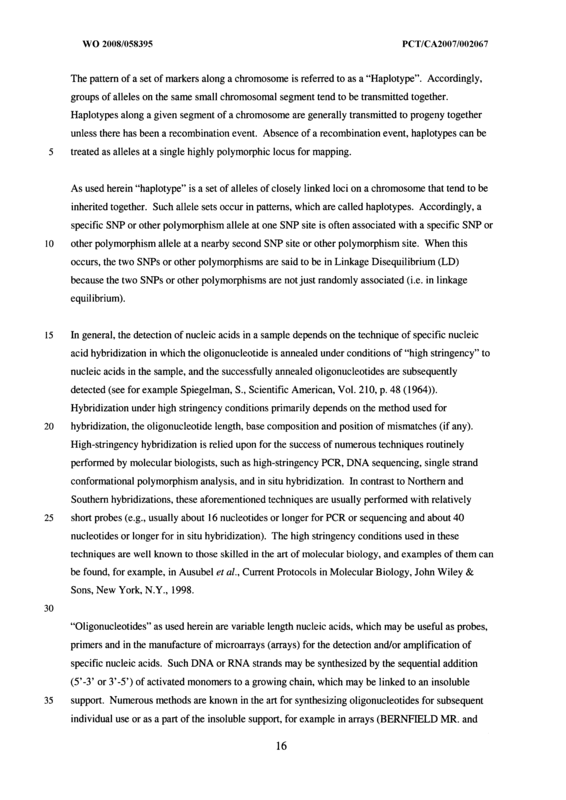 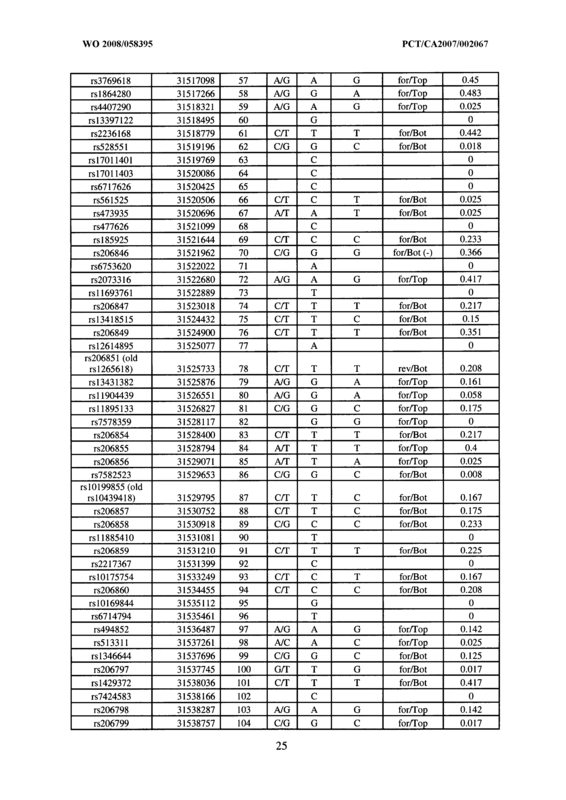 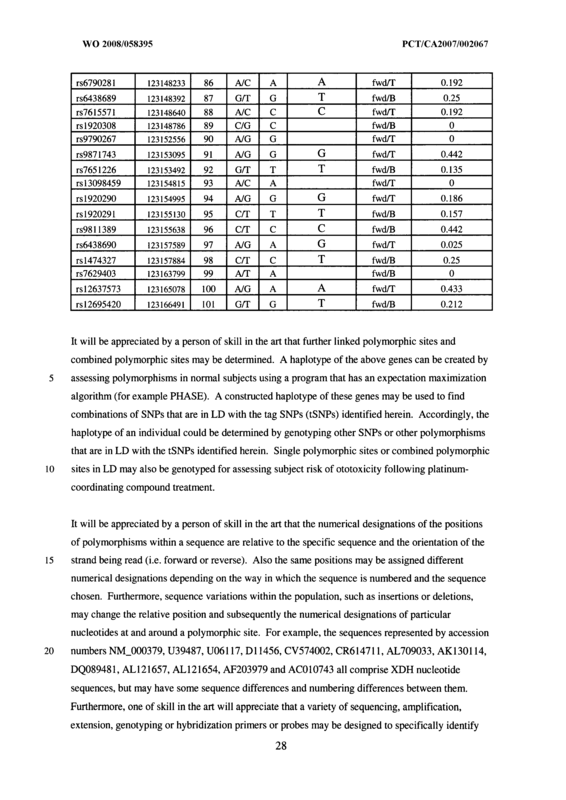 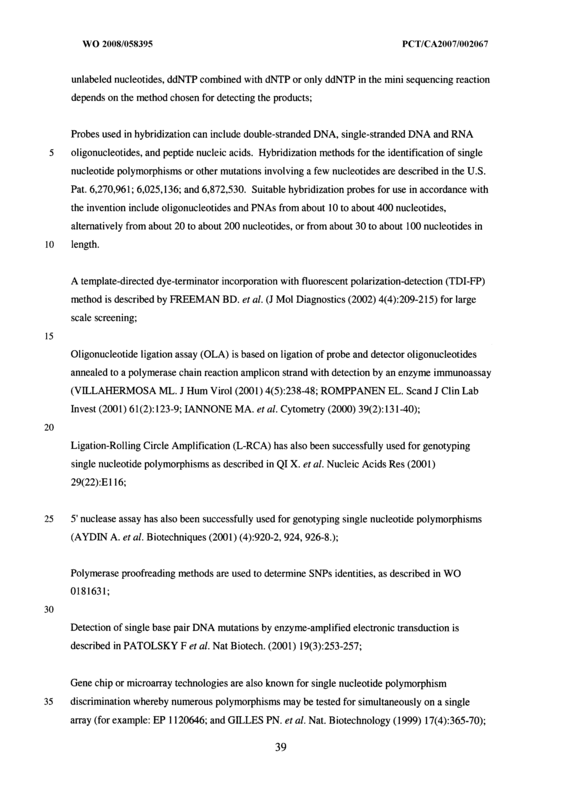 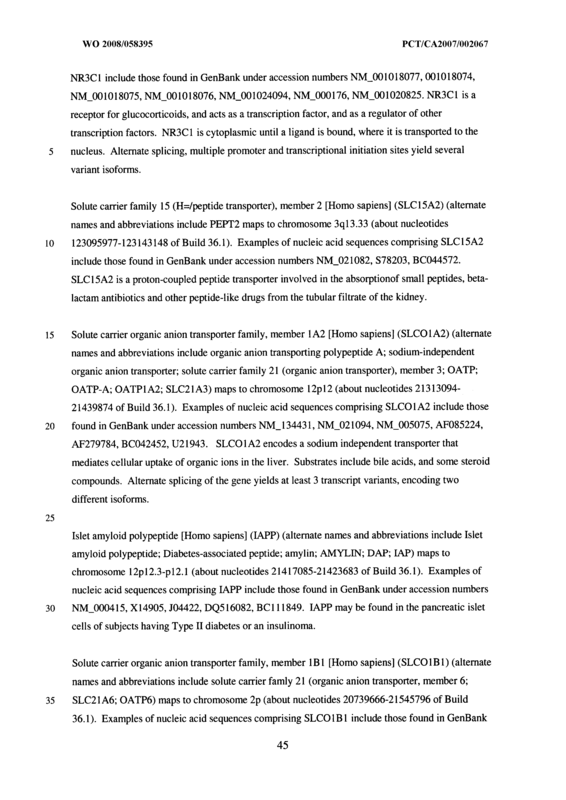 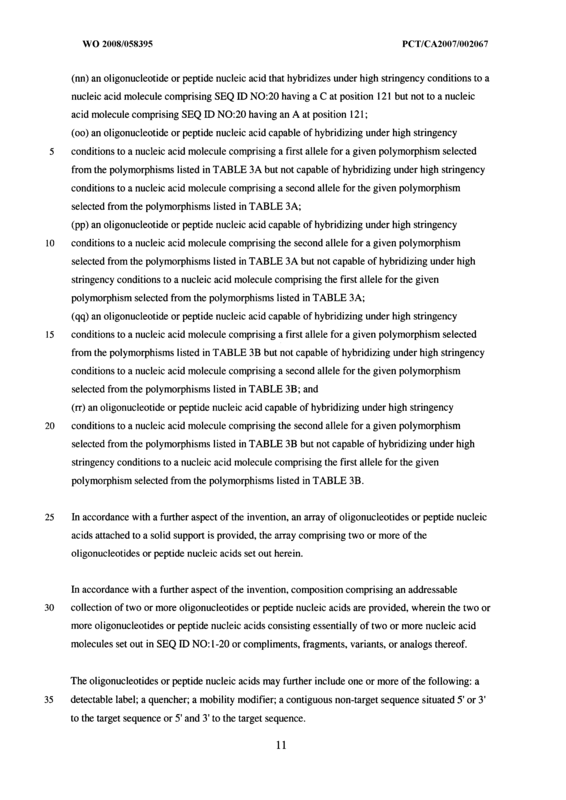 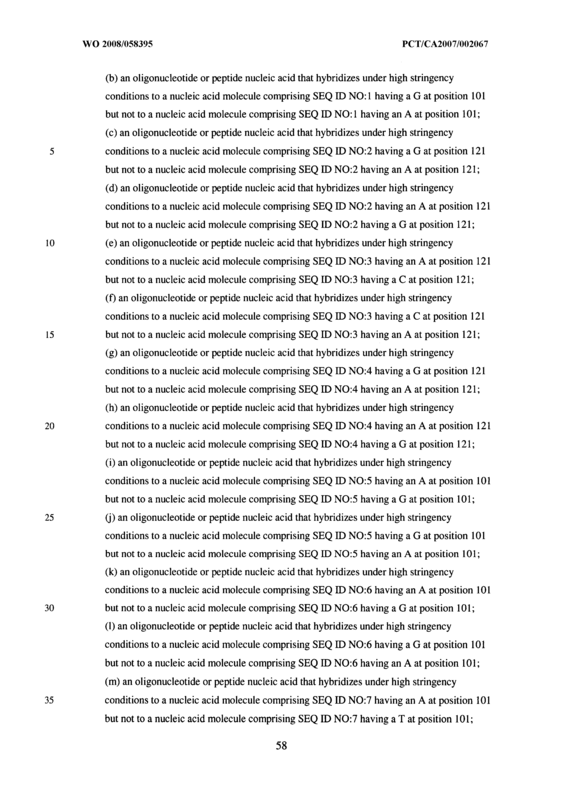 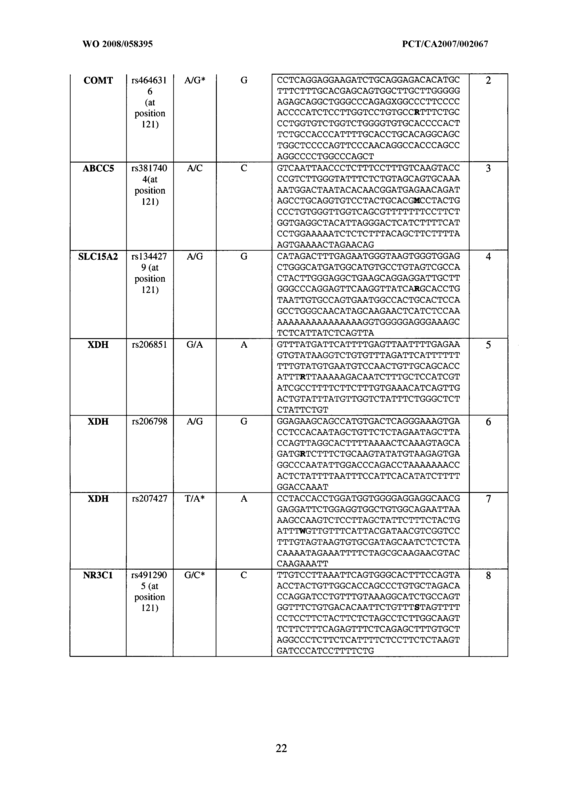 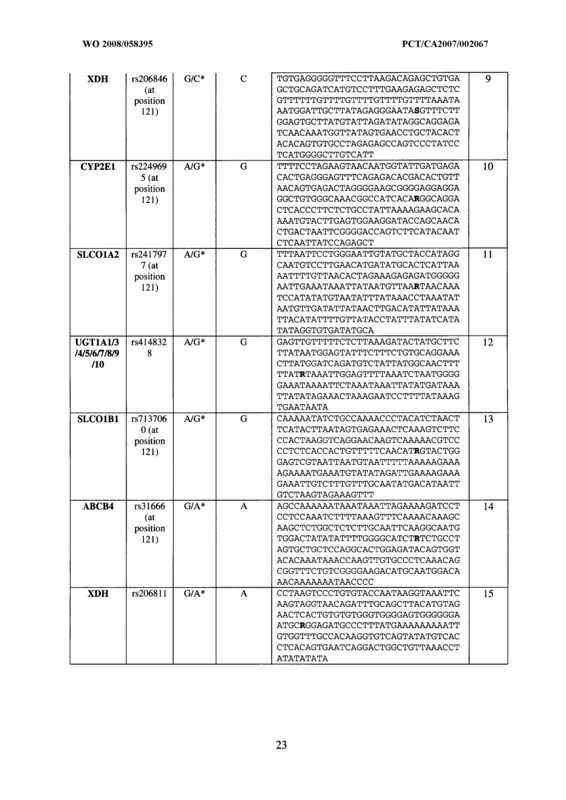 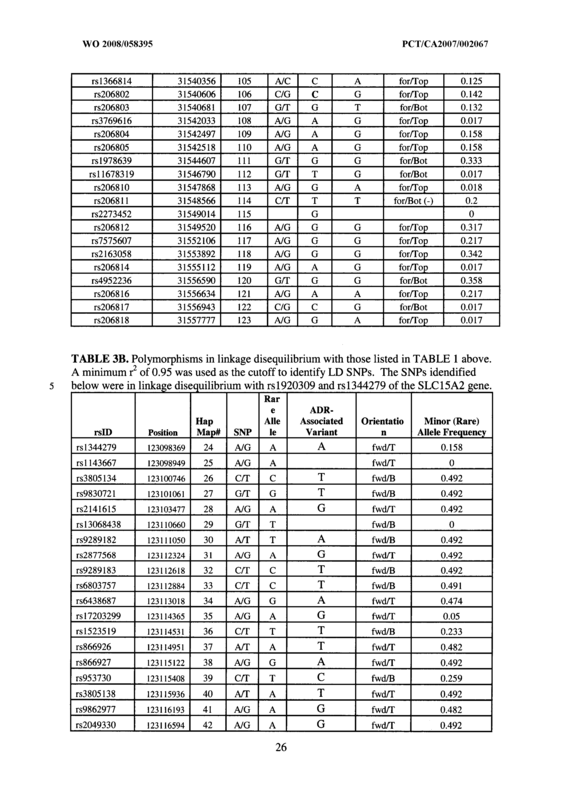 The oligonucleotides or peptide nucleic acids of claim 21, wherein the one or more polymorphic sites in linkage disequilibrium thereto is selected from one or more of the following polymorphic sites: rsl7011368; rsl366817; rs2281547; rs2163059; rs6733391; rs6718606; rs6720163; rs3769618; rsl864280; rs4407290; rsl3397122; rs2236168; rs528551; rs 17011401; rsl701 1403; rs6717626; rs561525; rs473935; rs477626; rs 185925; rs206846; rs6753620; rs2073316; rsl 1693761 ; rs206847; rsl3418515; rs206849; rs 12614895; rs206851 (old rsl 265618); rsl 3431382; rsl 1904439; rsl 1895133; rs7578359; rs206854; rs206855; rs206856; rs7582523; rslO199855 (old rslO439418); rs206857; rs206858; rsl 1885410; rs206859; rs2217367; rslO175754; rs206860; rslO169844; rs6714794; rs494852; rs513311; rsl346644; rs206797; rsl429372; rs7424583; rs206798; rs206799; rsl366814; rs206802; rs206803; rs3769616; rs206804; rs206805; rsl978639; rsl 1678319; rs206810; rs206811; rs2273452; rs206812; rs7575607; rs2163058 ; rs206814; rs4952236; rs206816; rs206817; rs206818; rsl344279; rsl 143667; rs3805134; rs9830721; rs2141615; rsl3068438; rs9289182; rs2877568; rs9289183; rs6803757; rs6438687; rsl7203299; rsl523519; rs866926; rs866927; rs953730; rs3805138; rs9862977; rs2049330; rs2049331 ; rs9812515; rsl 357531 ; rs2700420; rs2332046; rs2877567; rsl l914993; rs2877566; rs2689283; rs2700421; rsl 1920521 ; rs7637569; rs2293616; rs2293614; rs2293613; rs2257115; rs2257119; rs2257132; rs2257212; rs2257214; rsl 143670; rs3762819; rs3762821 ; rsl316397; rsl 143672; rs2700424; rs874742; rs874741 ; rsl920315; rs3817599; rsl920314; rsl920313; rs4388019; rs4285028; rsl920312; rsl920311; rsl920310; rs2689275; rs9829181; rs9867460; rsl0934565; rsl343979; rsl920309; rs6790281 ; rs6438689; rs7615571; rsl920308; rs9790267; rs9871743; rs7651226; rsl3098459; rsl920290; rsl920291; rs9811389; rs6438690; rsl474327; rs7629403; rsl2637573; and rsl2695420. 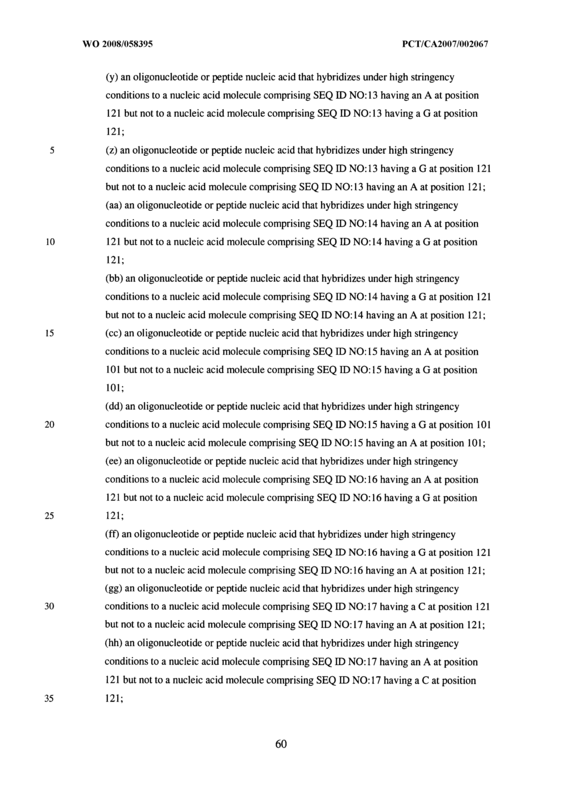 (nn) an oligonucleotide or peptide nucleic acid that hybridizes under high stringency conditions to a nucleic acid molecule comprising SEQ ID NO:20 having a C at position 121 but not to a nucleic acid molecule comprising SEQ ID NO:20 having an A at position 121; (oo) an oligonucleotide or peptide nucleic acid capable of hybridizing under high stringency conditions to a nucleic acid molecule comprising a first allele for a given polymorphism selected from the polymorphisms listed in TABLE 3A but not capable of hybridizing under high stringency conditions to a nucleic acid molecule comprising a second allele for the given polymorphism selected from the polymorphisms listed in TABLE 3A; (pp) an oligonucleotide or peptide nucleic acid capable of hybridizing under high stringency conditions to a nucleic acid molecule comprising the second allele for a given polymorphism selected from the polymorphisms listed in TABLE 3A but not capable of hybridizing under high stringency conditions to a nucleic acid molecule comprising the first allele for the given polymorphism selected from the polymorphisms listed in TABLE 3A; (qq) an oligonucleotide or peptide nucleic acid capable of hybridizing under high stringency conditions to a nucleic acid molecule comprising a first allele for a given polymorphism selected from the polymorphisms listed in TABLE 3B but not capable of hybridizing under high stringency conditions to a nucleic acid molecule comprising a second allele for the given polymorphism selected from the polymorphisms listed in TABLE 3B; and (IT) an oligonucleotide or peptide nucleic acid capable of hybridizing under high stringency conditions to a nucleic acid molecule comprising the second allele for a given polymorphism selected from the polymorphisms listed in TABLE 3B but not capable of hybridizing under high stringency conditions to a nucleic acid molecule comprising the first allele for the given polymorphism selected from the polymorphisms listed in TABLE 3B. 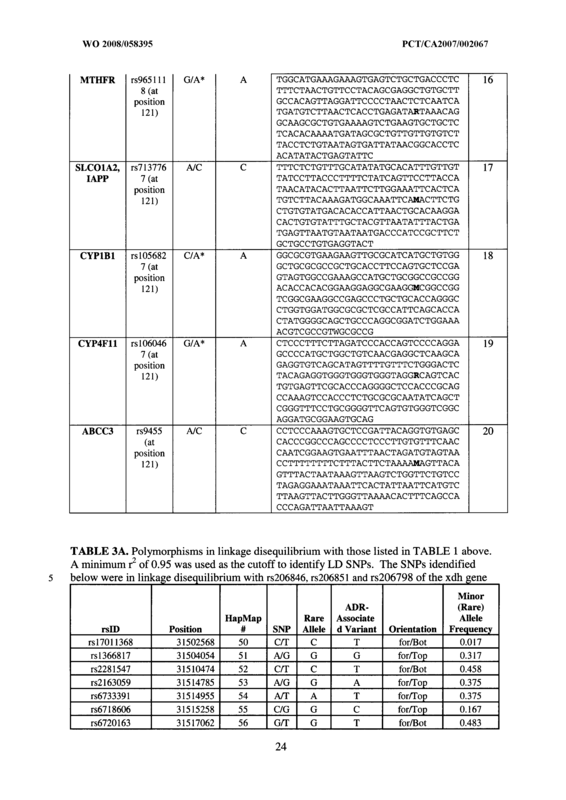 An array of oligonucleotides or peptide nucleic acids attached to a solid support, the array comprising two or more of the oligonucleotides or peptide nucleic acids set out in any one of claims 21-23. 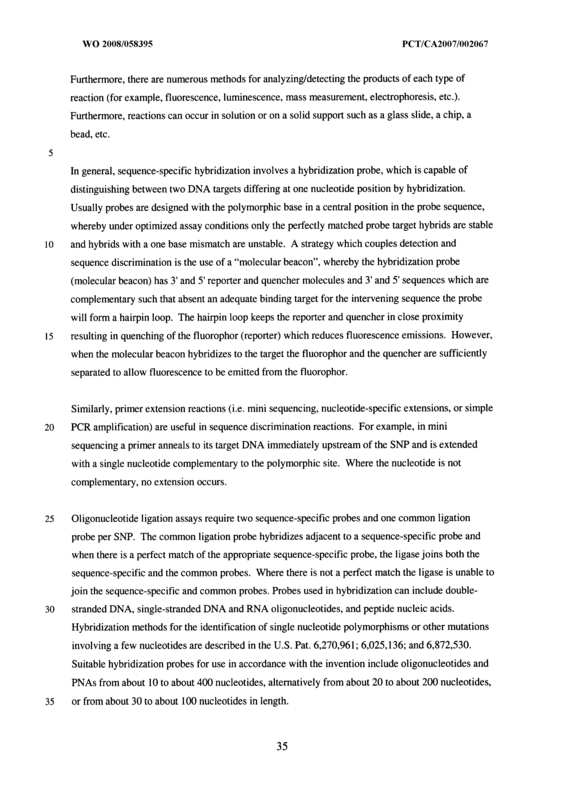 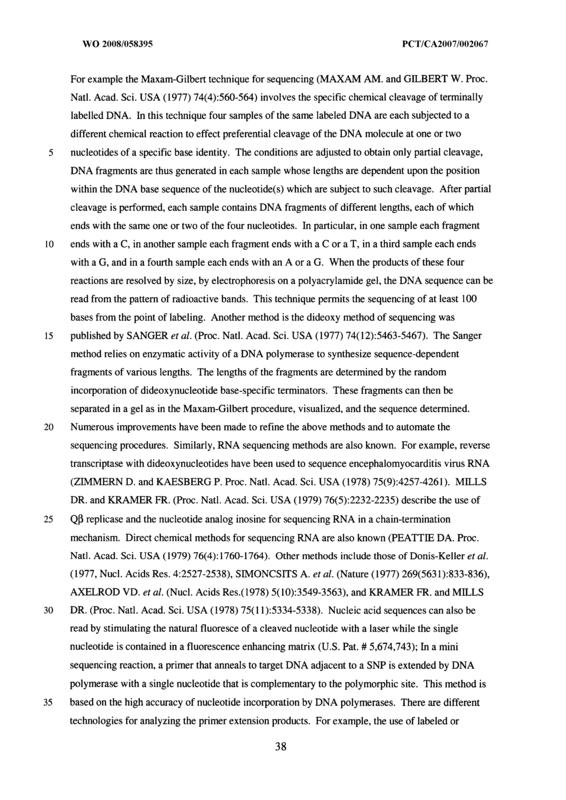 A composition comprising an addressable collection of two or more oligonucleotides or peptide nucleic acids, the two or more oligonucleotides or peptide nucleic acids consisting essentially of two or more nucleic acid molecules set out in SEQ ID NO: 1-20 or compliments, fragments, variants, or analogs thereof. 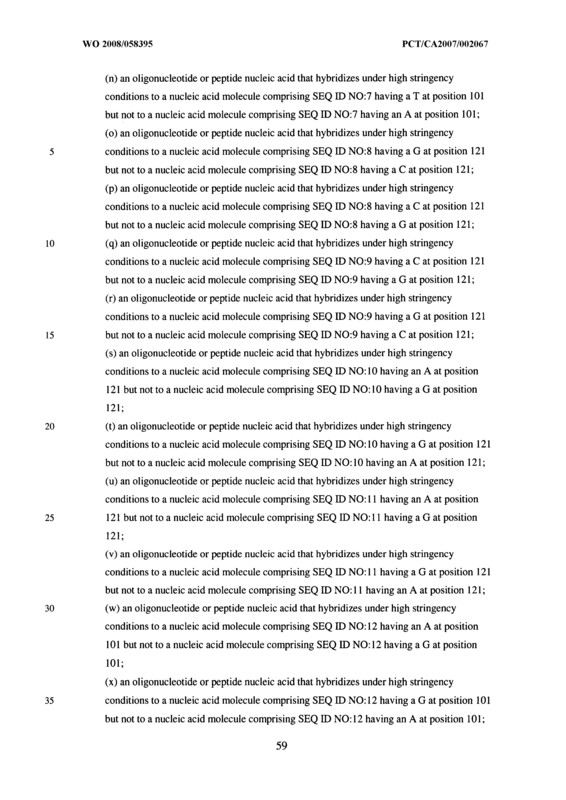 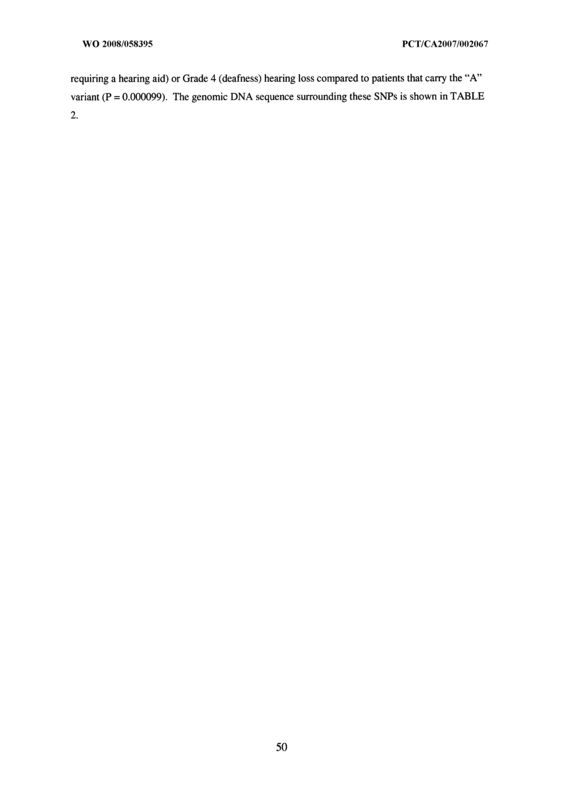 The oligonucleotides or peptide nucleic acids of any one of claims 21 to 23, further comprising one or more of the following: a detectable label; a quencher; a mobility modifier; a contiguous non-target sequence situated 5 ' or 3' to the target sequence or 5' and 3' to the target sequence.